Croatia and USA Strengthening Connections! Save Time and Money with Cortec's EcoClean&reg; Biodegradable Scale and Rust Remover powered by Nano VpCI® ! Cor-Pak® VpCI® Static Dissipative Bubbles Film Available at EcoCortec® Warehouse! Cortec's EcoShield® VpCI®-226 featured in Plastics Europe! Cortec® Named as Major Player in the Specialty Films and Active Intelligent Packaging Markets! Cortec's State of the Art EcoSol® Film Brings Added Quality to Bionetix's Natural Bioremediation Products! EcoCortec® - Europe's Biggest Producer of Anticorrosion Resealable Bags! Best Selling Anti-Corrosion Film Globally Celebrating 25th Anniversary! Cortec® - World's Fastest Growing Manufacturer of Corrosion inhibitors! Croatian bioplastics plant celebrates 10th anniversary! Fredonia Group Study Features Cortec® - Global Leader In VCI Industry! New Age Packaging Technology from Croatia! 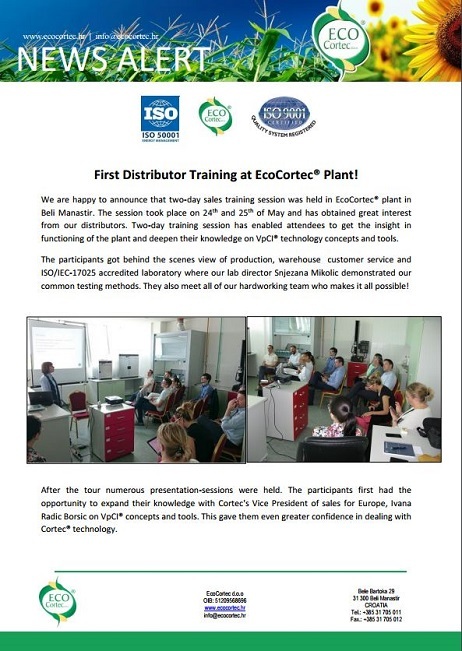 First Distributor Training at EcoCortec Plant! 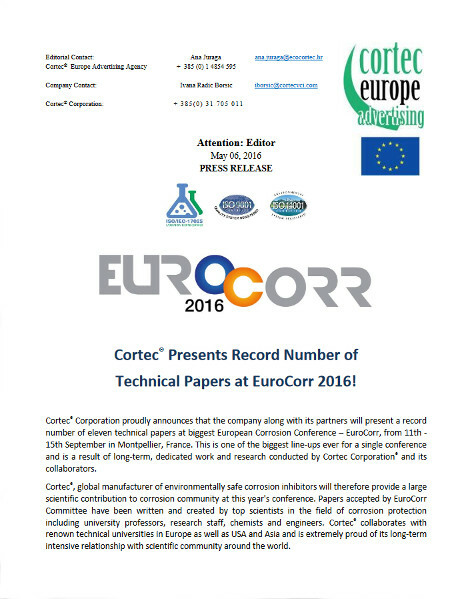 Cortec® Presents Record Number of Technical Papers at EuroCorr 2016! 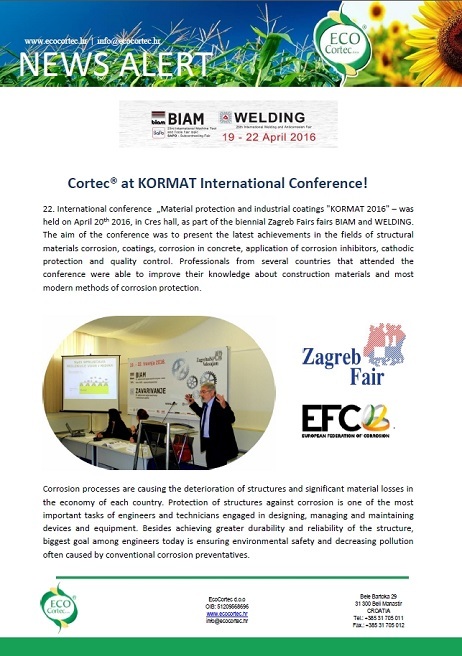 Cortec® at KORMAT International Conference! Join Us at EuroCorr 2016 Followed by Cortec® European Sales Meeting in Montpellier!! Cortec® And Corpac Attend The 2015 Fachpack - Leading The Industry In Corrosion Protection! EcoCortec® Announces Expanded Warehouse and a New High Tech Converting Line for Patented VpCI® Resealable Bags! Workshop Seminar on VpCI® Corrosion Inhibitors Organized by Faculty of Mechanical and Naval Engineering! Multinational Giant Utilizing EcoCortec®'s High Tech, CoExtruded Static Dissipative Bags! Cortec's 32nd World Sales Meeting - The Most Successful Yet! Record Number of Visitors at Cortec®'s Booth at European Corrosion Conference - EuroCorr! EcoSol® Water Soluble Film Technology - Newest Generation of Packaging Solutions! Company Announcement - EcoSol® is a water soluble, biodegradable, polyvinyl alcohol film ideally suited for various packaging applications. Water soluble PVOH bags, sachets, or pouches created from this unique, technically advanced film provide a convenient, safe, and economical delivery system for a wide range of products; including detergents and cleaners, degreasers, concrete additives, pigments, biocides, water-treatment products, agricultural products and others. EcoSol® film has excellent organic solvent resistance, which allows EcoSol® pouches and bags to be used not only for dry powders, but also for liquid products. This contemporary film offers very good mechanical properties: tensile strength, tear strength and puncture resistance. These properties allow EcoSol® to be used in a wide variety of rigorous applications. EcoSol® expands Cortec’s rich line of biodegradable materials: after a few minutes of immersion at the specified temperature, the environmentally safe film dissolves in water leaving a harmless, non-toxic, aqueous solution of polyvinyl alcohol. Once the liquid solution of PVOH comes into contact with common microorganisms, such as those found in water-treatment plants, conversion to carbon dioxide and water takes place within about 30 days. EcoSol® bags are chemically resistant to: mineral, vegetable and animal oils as well as aliphatic hydrocarbons – and ethers, esters, ketones. EcoSol® can be used for packaging of: Detergents and cleaners, Degreasers, Concrete additives, Pigments, Water-treatment products, Biocides, Agricultural products, Soil remediation, Bathing products, Cosmetic industry (disposable cases) and Laundry bags for hospitals. EcoSol® bags were a part of a "green" initiative conducted by Wright Patterson Air Force Base where all products and processes were being evaluated for environmental impact. They decided to change applications for cooling and heating systems to "green" and safer alternatives. They selected Cortec's products: Boiler Lizard® and Cooling Loop Gator® packed in EcoSol® bags and got a clean, reliable, efficient, and environmentally safe solution that provided excellent corrosion protection. Mechanical properties of EcoSol® packaging conform the normative of ASTM D 882-02 for Braking factor, Tensile Strength of break, Elongation and Yield Strength; It's Tear Strength is tested according ASTM D 1922-06a and Dart Drop Impact resistance - per ASTM D 1709-04. EcoSol® produced by Cortec®'s Advanced Films Division has been included in the market study: "Water Soluble Film Market – "Global Trends and Forecasts to 2020" by think tank institution Research and Markets, Inc as the only USA manufacturer. CorShield® VpCI®-146 Creped Paper: Packaging For Multi-Metal Corrosion Protection! 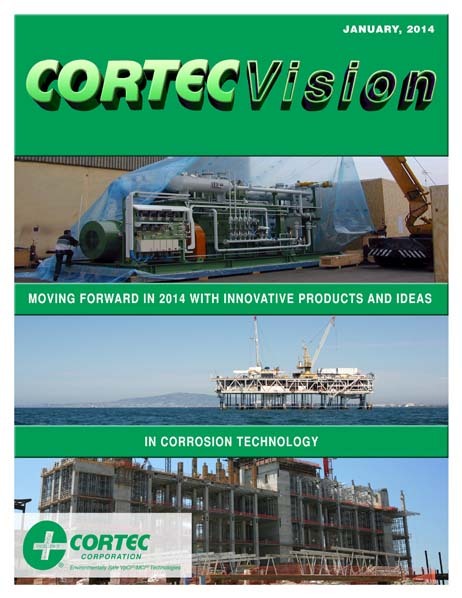 EcoCortec® and Cortec® at EuroCorr 2015 – Europe's most Important European Corrosion Congress! 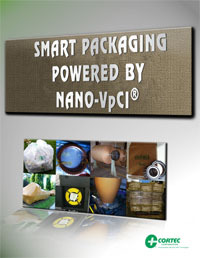 Cortec® has published its NEW “Smart Packaging Powered By Nano-VpCI®” Brochure. This brochure provides information on the unique methods and benefits of using Cortec’s packaging products to prevent corrosion over what the competition offers. The entire Vapor phase Corrosion Inhibitor (VpCI®) packaging solutions are detailed and categorized into the following groups: Papers, Films, Foams, Fabrics, Cushioning, Inserts, Compostable, and Eco products. The brochure includes a buyer’s guide that expands upon the product descriptions, protection, and sizing options. Corrosion is a constant, indiscriminate, and costly enemy of metal, especially when packaged for storage and transportation. Traditional anti-corrosion methods are messy, expensive, and can be hazardous to personnel and the environment. Cortec® products utilize Patented Nano-VpCI® technology, to provide safe and cost-effective methods for preventing and diminishing damage caused by corrosion. Cortec’s Smart Packaging powered by Nano-VpCI® technology offers environmentally safe methods of treatment with no toxicity and pol­luting effects. Unlike corrosion inhibiting systems of the past, Cortec’s VpCIs do not contain chromates or other heavy metals, nitrites, or chlorinated hydrocarbons. These products provide multi-metal corrosion protection, even for packaging that is repeatedly opened, for up to 24 months. They deliver corrosion protection in aggressive environments to increase storage life; and with benefits such as waste reduction and maintaining premium prices, Cortec’s products provide safe and effective packaging solutions. With the support of our state-of-the-art cor­rosion scientists, engineers, and testing facility, Cortec® can provide simple, environ­mentally friendly, cost-effective solution to any corrosion problem. In a rapidly growing market, Cortec® continues to lead the industry of packaging solutions with its innovative smart packaging products. Many of these unique products conform to ASTM G 1, ATMS G3 Standard Test Methods, NACE Standard TM-01-64 for Laboratory Corrosion Testing of Metal for the Process Industries, and NACE Standard TM 0169-95 for Laboratory Corrosion Testing of Metals. EcoCortec®, one of the most advanced manufacturers of bioplastic materials in Europe has successfully finalized ISO 9001 and ISO 50001 certification audit. After several months of preparations and finalization tasks the plant is now in the process of certification. These certificates will enable optimizing EcoCortec®'s operations and enhance plant's competitiveness even more to access global markets. Quality management system will ensure that company’s operations are running at maximum efficiency, safety and quality. Certification audit was conducted by TÜV Croatia, member of world renowned TÜV NORD group. TÜV NORD is among the global leaders in technology services with aim of accompanying its clients with prudence and foresight into the future. Meeting the requirements of these standards will provide EcoCortec® with excellent quality management systems and the foundation to better customer satisfaction, staff motivation and continual improvement, continuing EcoCortec®'s dedication to excellence. Cortec® Corporation is one of the global leaders in innovative, environmentally responsible VpCI® and MCI® corrosion control technologies for Packaging, Metalworking, Construction, Electronics, Water Treatment, Oil & Gas, and other industries. Its relentless dedication to sustainability, quality, service, and support is unmatched in the industry. Headquartered in St. Paul, Minnesota, Cortec® manufactures over 400 products distributed worldwide. ISO 9001, ISO 14001:2004, & ISO 17025 Certified. New State Of The Art Extrusion Line in EcoCortec®! Coming from Cortec's® EcoSonic line, vapor-phase corrosion inhibitors (VpCI®)-105 Emitters powered by NANO-VpCI are unique, patented, compact, space-saving and high-tech systems. They are designed to provide corrosion protection for metal components and parts enclosed in non-ventilated control boxes, cabinets or tool boxes up to 142 L (5 cubic feet). These economical, non-toxic and safe-to-handle emitters emit VpCIs, which form a monomolecular protective coating on all metal surfaces. Corrosion of complex electronic and electrical equipments is an increasingly serious problem which triggers expensive failures during manufacturing, shipping, storage or field operations. It can be caused by numerous factors such as salt, humidity, moisture and contaminants. By using Ecosonic VpCI-105 Emitter, corrosion can be stopped at any step from manufacturing to final installation. EcoSonic VpCI-105 is a plastic emitter with a breathable Tyvek® membrane through which the corrosion inhibitor is released. It provides long-term protection against corrosion even in the presence of adverse conditions including salt, moisture, airborne contaminants, H2S, SO2 and NH3and others. VpCI-105 Emitters are very effective in polluted and humid environments and provide continuous protection for up to 24 months. These emitters do not interfere with electrical, optical or mechanical surface properties, they are extremely simple, quick and convenient to install and protect during operation and shutdown. Products are free of nitrites, halogens and phosphates and have very low volatile organic compounds (VOC) values. No spraying, wiping or dipping is required. - hand-held battery-operated devices, tool-boxes, gun safes and any other enclosure for metal storage. Ecosonic VpCI-105 Emitter meets Southern California Clean Air Act and other national and local regulations. It is accepted by the Food and Drug Administration for corrosion protection of electrical and electronic equipments within food processing plants and approved for the US military and NATO as well as NSN 6850-01-406-2060. The product conforms to NACE Standard 0487-2000, MIL I-22110C and is RoHS-compliant (Figure 1). (Figure 1) VpCI 105 Emitters belong to Cortec®'s Ecosonic line of high-tech corrosion protection products for electronics and electricals, designed with the environment and safety in mind. Cortec® Recertified For ISO 14001:2004 – Continuing Dedication To Excellence! According to NQA, The ISO 14001 standard offers a number of important benefits for companies whose business operations impact the environment, either directly or indirectly, or who simply are concerned about maintaining an environmentally conscious image in the eyes of their customers or the general public. When developed and implemented effectively, ISO 14001 can even enhance an organization's bottom line through increased efficiency of operations and by attracting environmentally conscious customers by taking a more eco-friendly business approach. ISO 14001:2004 provides Cortec® with the structure for effective EMS methods. Our Environmental Management System Committee, and employee teamwork enables us to formulate and follow ISO 14001-compliant processes. It ensures that the EMS maintains control of all Cortec's activities that may have an impact on the environment, also allowing us to identify and modify or eliminate potentially environmentally harmful processes before they cause damage or injury. Cortec® was one of the first ISO certified companies in Minnesota. We received our first ISO 14001:2004 certification in 1998. Now, in a time when stringent regulations are being developed and implemented to protect the environment on a daily basis, Cortec® has continued to develop products and procedures that benefit this world we live in, providing a clean and safe environment for future generations. Cortec® On The Cutting Edge Of Inkjet Printing Innovation On VpCI®-137 And BioPad® Products! PRESS RELEASE: Cortec® Presents New MilCorr® Fire Retardant VpCI® Shrink Film -Undefeatable by All Forces of Nature! Cortec® Presents New MilCorr® Fire Retardant VpCI® Shrink Film -Undefeatable by All Forces of Nature! latest Export Packaging Advancement From EcoCortec d.o.o. Croatia Featured in Packaging Design!! Failure of Intercept Shrink Film on Hawaiian Islands! EcoCortec®, the most advanced manufacturer of films and bags in Europe that recently increased its capacities due to growing client demands is proudly announcing the latest addition in its wide range of packaging products. 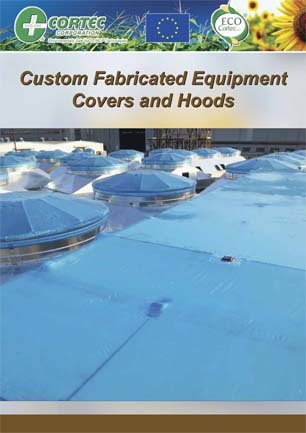 The plant will be offering special custom VpCI® film covers/hoods in various sizes and shapes. Cortec®'s MilCorr® VpCI® Shrink Film and VpCI-126® High Performance Film with premium corrosion protection are now available in small series and special shapes. These high strength, high performance covers are designed to replace wooden crates, containers, metal, plastic and wooden boxes. They are light weight thus reducing transportation costs while being non- toxic and recyclable thus improving carbon footprint of equipment manufacturers. Cortec® MilCorr® VpCI® Shrink Film and VpCI®-126 High Performance Film are latest technology heavy duty films featuring Cortec®'s world renown multimetal (VpCI®) Vapor phase Corrosion Inhibitors. They enable strong protection of surfaces against the most powerful elements of nature. These films can be used to protect products for storage, preserving or shipment in safe VpCI® environment. They combine the latest film technology with premium corrosion protection for all multimetals. Both are safe for handling and economical to use by significantly reducing labor for crating. Metal parts packaged in MilCorr® or VpCI®-126 High Performance Film receive continuous protection against salt air and humid environments, moisture, aggressive industrial atmospheres and dissimilar metal corrosion. The VpCI®'s vaporize and condense to metal surfaces in the enclosed package, reaching every area of the part, even hardest-to-reach interior surfaces. This allows complete product protection during storage as well as during domestic and overseas shipments virtually eliminating any rust claims. Obama Announces New Initiative To Stregthen U.S. BIO-BASED Manufacturing! The World's Largest VCI/VpCI® Plant Just Got Larger - Faster - Better! Cortec® Corporation, the World Leader in Innovative Corrosion Protection Solutions, is very proud to announce the production expansion of Cortec® Coated Products (CCP) the world's largest producer of VCI/VpCI® coated paper. The machine expansion allows patented coating chemistries production of jumbo rolls at 100" wide (2.5m) and processing 2000 ft. per minute. This new development has brought Cortec's Coated Products to full capacity - making it one of the most modern paper coating plants in North America. The newest addition to the existing kiwi printer is the state-of- the-art 3200mm A&F 2-drum slitter rewinder machine, which will improve quality and speed up the processes. Cortec® Coated Products is a manufacturer of coated specialty paper, board, and films for he printing and packaging industry. Cortec® Coated Products goal is to develop innovative ideas and creative solutions designed and based on a culture of high standards, manufacturing extraordinary quality coated papers and films, while providing superior service to our customers. Growing customer needs gives Cortec® Coated Products the opportunity to continuously invest millions of dollars to improve and expand its production lines with new equipment, facilities, and new processes, which strengthens the plant's position in the market and efficiently meets customer's needs and expectations. NACE Corrosion Press Completes Special Report On Corrosion Inhibitor Market! Cortec Corporation and Tart at Future Forces 2014! Cortec Corporation and our Czech distributor, Tart have successfully participated at the 11th International Defense and Security Exhibition and Conference, FUTURE FORCES 2014 which took place from October 15 -17 in Prague, Czech Republic. Almost 130 exhibitors, 500 experts attending international workshops and 580 official delegates from 48 countries makes FUTURE FORCES 2014 the biggest meeting of defense and security industry. Widely supported by authorities from NATO and Partner Countries all over the world, FUTURE FORCES 2014 hosted respected defense and security professionals worldwide. This event has been a great opportunity to present Cortec military corrosion prevention solutions. Cortec has also been invited to present the use of successful corrosion protection systems for different problems identified by the US military as well as military worldwide at the Capable Logistician Workshop. At the Workshop we were able to meet with military logistics professionals to share current needs and discuss future business opportunities. We have received a lot of positive feedback from our booth visitors which affirms our constant striving to be a global leader in innovative, environmentally responsible VpCI® and MCI® corrosion control technologies. Among other visitors, we were honored to welcome Brig. Gen. William E. Cole of US Army to our booth. It has been a great show and the cooperation with our partner Tart has been a wonderful experience! One of the most beautiful cities in Europe, Budapest, has shown to be an excellent choice for this year’s Cortec®’s European Sales Meeting. The Hungarian capital famous for its unique historic and artistic life welcomed the record breaking number of attendees to this year’s meeting. Partners operating in sixty countries throughout Europe and Asia gathered to share their business experiences, expectations and have loads of fun with their associates. On October 8th, the meeting started at wonderful Le Méridien Budapest Hotel, ideally located in the heart of Budapest, a few steps from the blue Danube with a welcoming cocktail reception. The next day meeting kicked off with welcoming speech of Boris Miksic, Cortec®'s President and CEO who opened the meeting with state of the company address. During his presentation Boris Miksic also remembered Cortec®'s journey throughout the years from it’s humble beginnings to becoming a global leader in corrosion protection with no relevant competitor on the market. Educational presentations and sessions were featured by Cortec®/EcoCortec® team members and our distributors, highlighting Cortec®'s products, technologies, the latest developments and successes. We are very glad that EcoCortec®’s partners from Marine Clean project have joined us and that the final Marine Clean meeting was held in Budapest. On October 10, the attendees were taken to Beli Manastir where they visited EcoCortec® facility which is currently in the second phase of the plant's planned construction and expansion. During the tour they explored the plant’s production facility, offices and one of the best equipped laboratories in Europe. A special success was hands on extruding and converting session where our distributors had the opportunity to participate in the daily activities of EcoCortec® production team. Wrap up sessions and distributor presentations were held at Beli Manastir’s Patria hotel. Both Cortec® and EcoCortec® presented awards for best European sales, fiscal year 2013/2014. The winners were Interface Technologies, France, for Cortec® and Tribotec, Sweden, for EcoCortec®. We congratulate the winners and keep up the good work! heart of Baranja’s intact nature. In this rich natural oasis full of organic fruits and vegetables everyone enjoyed chatting while tasting excellent local wines. The meeting ended with an unforgettable party and celebration of our CEO Boris Miksic’s birthday at one of Baranja region’s finest restaurants - Josic. The best local specialties including exquisite local Dobos cake were offered while Tamburitza band kept everyone dancing through the night. Beli Manastir's Mayor, Mr. Ivan Dobos and his wife Augusta gave us a special honor with their attendance of our gala dinner at Josic. How much the guests enjoyed these fun and educational few days illustrates a note from our UK colleague Steven Cartlidge from Lake Chemicals: „I would like to thank you all for opening up some wonderful sales opportunities. 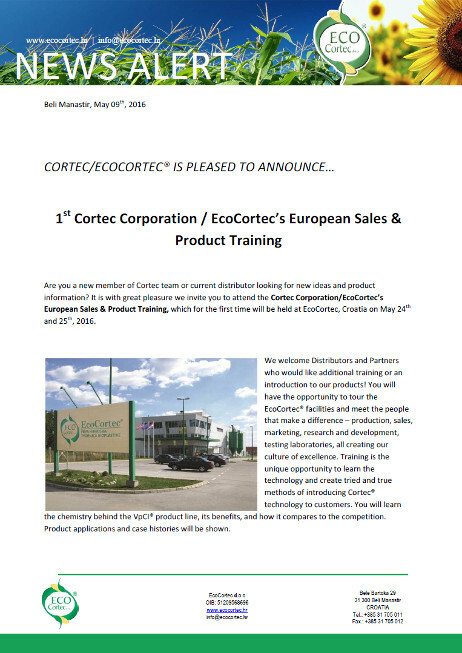 EcoCortec® put together a rewarding sales meeting with an unusual intimacy that I have learnt is the mark of Cortec®. Thank you to the Cortec team!“. Thank you Steven and we already can't wait for the next one! Europe's Biggest VCI/VpCI Plant Just Got Bigger! EcoCortec, the most advanced manufacturer of films and bags in Europe is very proud to announce expansion of the plant due to increased client demands. We have recently released into our operating process a new line of extrusion with higher capacity, therefore the plant's production capacity went up by 50 percent. For EcoCortec team, expansion of production and new equipment procurement is essential and never over, resulting in plant's continuous growth and stronger market presence. EcoCortec® has began the second phase of the plant's planned construction and expansion including- a new production hall with three new extrusion lines, branding of VpCI paper® and storage of Cortec® chemical products. EcoCortec specializes in manufacturing Cortec Corporation's innovative Vapor phase Corrosion Inhibitor (VpCI) films that have become a gold standard throughout the world in the corrosion protection business. The plant's products are exported to all European countries as well as Asia. EcoCortec offers customers complete converting, extruding, and printing capabilities. We manufacture films and bags according to customer specifications in terms of product size and performance, and are very flexible when it comes to order sizes and meeting special customer requests. Our products are tested in Cortec's ISO/IEC-17025 accredited laboratory. EcoCortec will also warehouse Bionetix biological products. Bionetix International, a Canadian company in the ownership of Cortec Corporation is in the business of manufacturing microbial based bio-products. The continuous expansion of production and new equipment procurement is never completed. Establishing a stronger market presence requires acquisitions of new equipment with different capacities. We have recently released into operations a new, high capacity extrusion line and have increased our capacity by 50 percent! EcoCortec is entering the third phase of the plant's planned construction and expansion. This includes a new production hall with three new extrusion lines, branding of VpCI paper® and storage of Cortec® chemical products. Line #3 will start up in December with another boost of capacity by 25 percent. 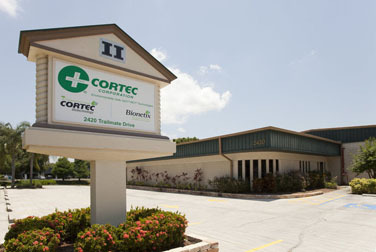 EcoCortec® will also warehouse Bionetix biological products. Bionetix International, a Canadian company in the ownership of Cortec® Corporation is in the business of manufacturing microbial based bio-products. 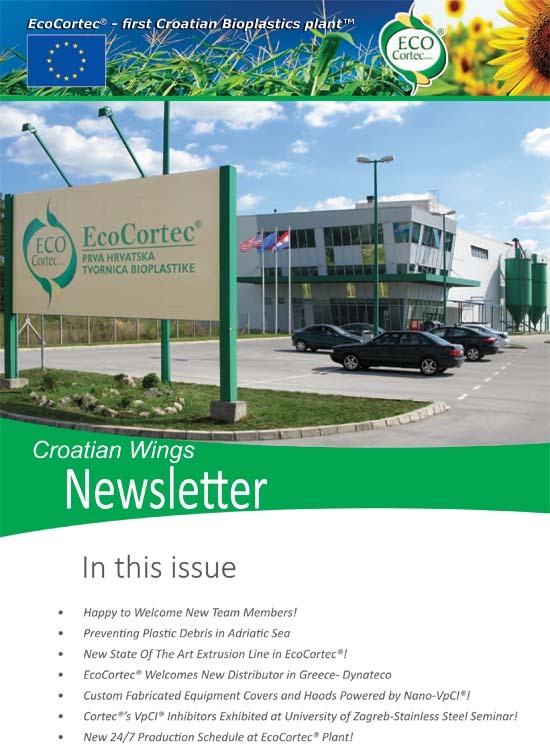 EcoCortec® d.o.o., headquartered in Beli Manastir, is the first Croatian bioplastics plant and a forward-thinking facil- ity founded by the owner, Mr Boris Mikšić, with eco-efficient and environmental solutions at its heart. Libby White from Packaging Europe was given a tour of the modern plant, in addition to a visit to the Cortec® European office lo- cated in Croatia's capital, Zagreb. Furthermore a tour of the University of Zagreb's corrosion research laboratory with a close relationship to the Cortec® Corporation, as well as a visit to Mr Mikšić's ecological peach farm, demonstrates that the owner's passion for eco-thinking extends further than the many patented innovations on offer. The Cortec® Corporation consists of six plants and international warehous- ing. The World Headquarters are based in Saint Paul, Minnesota and other plants making up the varied portfolio include Cortec Coated Products in Eau Claire, Wisconsin, Cortec Spray Technologies in Spooner, Wisconsin, and Cortec Advanced Films in Cambridge, Minnesota. The EcoCortec® division is based in a geo-strategic location, which can be reached easily by the trans-European cor- ridor, by railway, air, and the Danube river. Starting its operations in 2008, EcoCortec® functions today with 22 employees and a turnover of €3.5 million in 2013, exporting 98 per cent of its products. As the largest producer of patented Vapor phase Corrosion Inhibitor (VpCI®) anticorro- sion films and bags in Europe and the second largest in the world (after CAFD), EcoCortec® is strongly positioned as a market leader. It offers customers complete converting, extruding and printing capabilities with a main focus on biodegradable films and compostable films. On the cusp of expanding its production capabilities, EcoCortec® is already pre- sent in every European country and China with over 30 distributors representing its products. Plans for a new production hall with new extrusion lines, converting line for VpCI paper and storage of Cortec® chemical products will further strengthen the business and its offerings. polyethylene and biodegradable films. Our extruder can produce 180–200 kilos per hour and we offer in-line printing on a two-colour printer. We also have three con- verting lines with the ability to produce zip-lock and heat-seal bags in our highly automated production facility." The facility, in a 33,335-square-foot building, will be a manufacturing plant for some of the firm’s patented products. It will also be a distribution center, Miksic says, for Cortec clients in the Southeast U.S. and the Caribbean. Miksic expects to hire at least 50 people, a mix of engineers, chemists and IT personnel, to staff the facility. He projects it will open early next year after a test phase later this year. Cortec® VpCI-146 paper in Europe! We are happy to inform you that from now on EcoCortec will be warehousing standard VpCI-146 roll stock 91cm x 183m, 122cm x 183m, 100cm x 183m and 120cm x 183m, as well as several sheeting sizes: 1200x800mm, 800x600mm, 1170x750mm, 910x500mm, 300x400mm, 300x180mm and 100x800mm. Now you can combine shipments of VpCI films, bags, paper, foam, chemicals, etc. on the same transport which will make your business easier and more economical. Cortec VpCI-146 paper can be used to protect products for storage and shipment in a wide variety of ways: single item packaging or interleaving, end closures for shipping tubes, insert strips for recessed areas in large packages, and as sheet liners or separators between products. As you know our EcoCortec team is here to help you increase your profits and respond to any request. This new stocking advancement is another step in improving our services and more importantly boosting your sales! - Complete Replacement for PE and Wax Coated Papers! displaying barrier properties better than those of wax or polyethylene coated paper or linerboards. oil and grease resistivity into one step. In addition to being safe to the environment, EcoShield® is in compliance with FDA regulations under 21 code of Federal Regulations for food contact. It can be used in applications where direct or indirect food contact may occur. In manufacturing process there is no chlorine or other bleaching chemicals which completely eliminates package contamination found with other papers on the market. Developed in Cortec® laboratories utilizing high-tech, patented, recyclable, and repulpable technology, EcoShield® Paper also displays a greatly reduced Moisture Vapor Transmission Rate (MVTR). In other words, it has a MVTR value similar to poly-coated papers and superior to waxed papers while still being biobased, economical, and environmentally friendly. There was a chaos around us with crazy Ferraris, Lotuses, Porches racing like there's no tomorrow. As it was raining quite heavily, I decided to use the power of W12 in straight stretches and inside track in sharp curves as our GTC was much heavier than MacLaren. At one point during second circle a black Porche catapulted out of nowhere between us probably topping over 250 km/h while we were pacing at 220. I thought for a second the Porsche driver was a bit out of control but my eyes were on MacLaren trying to keep pace with the legendary race car. We are proud to announce that Croatian plant, EcoCortec®, the most advanced manufacturer of biodegradable packaging in Europe played a major role in international 1,1 million Euros worth Marine Clean Project -'Marine debris removal preventing further litter entry', sponsored by CIP Eco-Innovation Program. Main goal of this important innovative project is preventing hazardous environmental impact of conventional plastic materials discarded at sea, as well as promoting sustainability and innovative technologies. 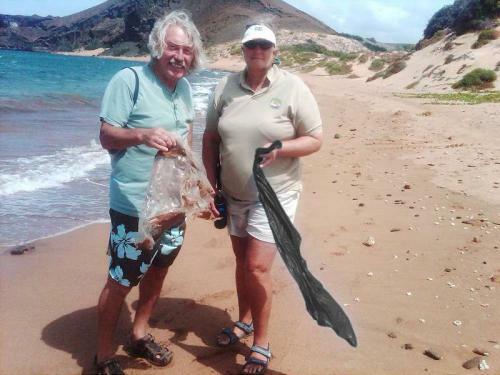 The project Marine Clean deals with decreasing marine litter – dangerous ecological problem that is growing rapidly. The great majority of marine litter (more than 90%) consists of plastics, which has become one of the biggest contaminants in the world's oceans. As most types of plastics are not biodegradable, plastic debris poses a serious threat to various living species, boats and coasts. EcoCortec® is participating in "Marine Clean" as a production partner for flexible packaging. In the framework of this project EcoCortec® introduced revolutionary EcoOcean™ material: film and bags constructed from the latest biobased polymer technology on the market, PHA. They are developed completely with the environment in mind and contain 77% of biobased content. EcoOcean™ is fully marine biodegradable and will biodegrade by anaerobic digestion in marine, natural soil and water environments, backyard composting systems and municipal composting facilities. It is is heat and moisture resistant making it ideal for compostable bags and many flexible film packaging applications. Some of the targeted markets for marine degradable packaging are: cruise lines, hotels and resorts in coastal areas of Europe as well as ecologically sensitive regions along rivers and lakes. Important aspect of the whole project is to influence change of policies within EU, in order to minimize pollution and develop new technological platform for the next generation of environmentally friendly products and practices, that can be implemented in all countries of European Union. EcoCortec®'s Success in Marine Clean Project! Cortec® MilCorr®: Stronger Than Mother Nature! MilCorr® VpCI® Shrink Film demonstrated outstanding resistance to the power of the storms. Cortec's MilCorr® VpCI® Shrink Film helps to greatly preserve surfaces against the most powerful elements of nature by providing non- toxic, environmentally friendly protection with corrosion inhibitors that can replace conventional rust preventatives such as oils and desiccants, offering an alternative to wooden crating, aluminum foils, and vacuum packaging. MilCorr® VpCI® Shrink Film is a heavy duty film featuring Cortec® multi-metal Vapor phase Corrosion Inhibitors (VpCI®) which provides top-notch universal protection to maintain the integrity of the film itself as well as the parts packaged within. Cortec Corporation manufactures and sells a line of corrosion inhibitors and other chemicals used in industries, including packaging, metal working and construction. Miksic said the Manatee County Cortec campus will house an office, a manufacturing facility, a warehouse and two laboratories for biotechnology and marine corrosion research. Cortec® Leaps Into The Future With The Addition Of Cortec® Biotechnology Campus In Florida! With the completion of its latest acquisition, Cortec® Biotechnology Campus, Cortec® Corporation and its subsidiaries are the world's largest producer of VCI, Vapor phase Corrosion Inhibitor (VpCI®), and Migratory Corrosion Inhibitor (MCI®). This new Campus at 2420 Trailmate Drive, Sarasota, Florida USA, is located in the modern industrial park of Parkland Centre near the Sarasota-Bradenton International Airport. It is the most state-of-the-art research facility, with 36,000 square feet (3,600 square meters) of office, manufacturing, warehouse, and two laboratory areas under one roof. Cortec® Biotechnology Campus will be equipped with cutting edge equipment for the manufacturing of Cortec's Nano-VpCI® coatings and Bionetix's bioremediation and cleaning products. Part of the warehouse will be designated for warehousing and shipping of Cortec® products that are deemed "freezable" and cannot be shipped out of our Minnesota or Wisconsin plants during the winter months. With operations in over 100 countries on 5 continents we know our warm climate partners will be very happy about this. This complex will also house two modern laboratories for biotechnology and marine corrosion research as well as sales and customer support offices for the Southeastern US, Caribbean, and Central and South Americas. EcoCortec - Part of CROPAK Ten-Year Retrospective Exhibition! to bring CROPAK closer to consumers emphasising the importance of this competition for the Croatian market. The exhibition has shown all previous winners of CROPAK prize, among them EcoCortec® as one of the first recipients of this prestigious award! categories on May 18th 2006 at "Plitvice Lakes" National Park. The ECOCROPAK category focuses on ecological packaging, machine or equipment for waste packaging management and a project for packaging and waste packaging management. EcoCortec® was one of 37 nominated in five different categories and was awarded the CROPAK 2006 “Eco Packaging” Award for its innovative biodegradable EcoWork® bags & films and the CROPAK 2006 “A Project for Packaging & Waste Packaging Management” Award for its EcoCortec® plant in Beli Manastir, Croatia. CROPAK award was designed with the aim of promoting the importance and benefits of packaging, emphasising packaging as an important factor in promotion and identification of the product. limits when creating and manufacturing a packaging product, an inseparable part of the product itself. Cortec® New Shrink Films Brochure Now Available! This latest Cortec® brochure highlights our Vapor phase Corrosion Inhibitor (VpCI®) Shrink Films; the most advanced corrosion inhibiting shrink films available on the market today! Cortec® films are trusted globally for transit and equipment preservation. This brochure outlines Cortec’s heavy duty shrink films that are coextruded on highly specialized, computer controlled equipment; and formulated from a unique blend of state-of-the-art polyethylene resins which features Cortec’s VpCI® and provides a top-notch universal multi-metal protection system. Fire retardant Milcorr® Shrink Film is the only shrink film currently on the market that offers 5 years outdoor protection against corrosion, UV rays, wind, sand, rain, snow, and ice. Cortec® VpCI® shrink films conform to military specification MIL-B-22019D, NACE Standards RP0487-2000, and TMO-2008. You can find out more information on film features, qualities, and characteristics in this brochure at the link below. Cortec®'s VpCI® Inhibitors – Great Success at University of Zagreb-Corrosion Seminar! The seminar ”Corrosion Inhibitor in Engineering Structures Protection“ was held at the Faculty of Mechanical Engineering and Naval Architecture, University of Zagreb, Croatia September 27, 2013. The seminar was attended by 60 engineers, technicians, production managers and other professionals dealing with the maintenance and protection of metal structures against corrosion. Attendees had the opportunity to deepen their knowledge about the most modern methods of corrosion protection in various aggressive environments. Among the technologies of corrosion protection a significant place belongs to the application of corrosion inhibitors. The goal of the seminar was to educate engineers in Croatia about the premium inhibitors in the industry. The technology behind inhibitors and the advantages of their use is still insufficiently known in Croatia and as a result this subject initiated great interest among industry experts. Seminar attendees had a chance to attend different sessions held by top professionals in the field in Croatia coming from scientific institutions and industry. After an introductory speech by Ph.D Vinko Simunovic, several presentations followed, covering the area of volatile corrosion inhibitors and emphasizing VpCI® Vapor Corrosion Inhibitor Technology, the best technology on the market. Managing director of EcoCortec®, Ivana Radić Boršić, presented VpCI® technology and demonstrated the use of new generation corrosion inhibitors for different industries. She also gave an overview of Cortec's range of products and presented EcoCortec® first Croatian plant of bioplastics. Unlike traditional hazardous products, Cortec®’s inhibitors are characterized by their high biobased content, sustainability, and high performance. The successful presentation was followed by numerous questions and interesting discussion. Utilising high-tech, patented, recyclable and repulpable technology, Cortec® has produced a multimetal corrosion protection paper, VpCI®-144, powered by Nano VpCI®, the premium moisture barrier corrosion inhibiting paper in the industry. VpCI®-144 is a environmentally safe replacement for polyethylene and wax papers, with water vapor barrier properties that are comparable to polyethylene coated paper. It is suitable for use with food processing equipment components not in direct contact with food, as recommended by FDA. This paper perfectly combines corrosion protection, moisture barrier properties, oil and grease resistivity into one step. Cortec's VpCI®-144 is simple to use and made from the highest quality recycled neutral/natural kraft paper and is coated with a water-based barrier coating. In manufacturing process there is no chlorine or other bleaching chemicals. This completely eliminates package contamination found with other VCI/VPI papers on the market. Historically, polyethylene and wax coatings have been used to seal porous paper to provide a moisture barrier and/or moisture-vapor barrier. When coated this way the resulting paper product is an environmental problem and cannot be recycled through normal channels. Cortec VpCI®-144 paper provides superior corrosion protection for both ferrous and non-ferrous metals, which eliminates the need to inventory a variety of papers for all the different types of metal you need to protect. Cortec VpCI®-144 is non-toxic, non-irritating, nitrite and amine free and fully recyclable/repulpable. It does not contain any silicones, chromates, other heavy metals or toxic products. That means it can be recycled into other types of paper products such as boxes, cardboard, and other corrugated materials. It can also be “repulped”: made into or mixed with pulp to make new paper products. Parts protected with Cortec® VpCI-144 can be painted, welded, and soldered. The thin protective film doesn’t influence physical properties of most sensitive electrical and electronic components, including conductivity and resistivity. The paper base stock for the VCI/VPI coatings is produced with closely packed cellulose fibers which form a relatively non-permeable sheet. This attribute produces a uniform coating, as well as prevents the coating from striking through the paper. Protective film does not need to be removed prior to further surface finishing or coating application. VpCI®-144 conforms to Military specifications MIL-P-3420E, NACE Standards TM0208-2008 and RP0487-2000, TAPPI Useful Method 253 and is RoHS compliant. EcoCortec®, the most advanced manufacturer of films and bags in Europe, is very proud to announce the phase three expansion of its Beli Manastir, Croatia plant. This expansion will double our manufacturing and warehousing capacities with this 3,000,000 euro investment. The new production hall will contain three new high-tech extrusion lines, confectioning line of VpCI® papers, and warehouse for various Cortec® products. EcoCortec® specializes in manufacturing Cortec® Corporation’s innovative Vapor phase Corrosion Inhibitor (VpCI®) films and offers customers complete converting, extruding, and printing capabilities. We manufacture films and bags according to customer specifications in terms of product size and performance, and are very flexible when it comes to order sizes and meeting special customer requests. Our products are tested in Cortec's ISO/IEC-17025 accredited laboratory. The plant is located on a 10,000 square meters site which places this facility in an excellent geo-strategic location of Central Eastern Europe. This new expansion, with new state of the art equipment, is a confirmation of EcoCortec's leadership in the field of biodegradable films manufacturing in Europe; and proof that our innovative ideas, quality products, and professional team obtain excellent results and growth even in the times of economic crises. The continuous expansion of production and procurement of new equipment is never really finished. By strengthening the plant’s position in the market, new requirements for equipment are growing every day. For this reason we are continuously widening our capacities. The new production hall will also warehouse Bionetix products. Bionetix International; headquartered in Montreal, Canada is a wholly owned subsidiary of Cortec® Corporation in the business of manufacturing microbial based bio products. It is comprised of solid, proprietary technologies to produce biological waste treatment products that are used in thousands of applications and various industries throughout the world. With this new expansion our plant has absolutely no relevant competitor in Europe. Great Time at EcoCortec® Picnic! The EcoCortec® team was happy to participate at the first annual company picnic on Saturday, July 13 . The picnic took place next to the EcoCortec® plant in the idyllic atmosphere of Baranja. Our team gathered with their families and dogs for a wonderful time enjoying the local food specialties of the Baranja region and chatting on a sunny day. Since the domestic Croatian music was playing in the background some singing was done as well! After the meal games were held, employees competed in Tug of War and Archery while the kids were playing and jumping in the castle bounce house. Then the most fun and long awaited moment moment arrived, when EcoCortec® director Ivana Radić Boršić announced the name of our Employee of the Year. We are proud that this year's winner is our production employee Boris Bošnjak. 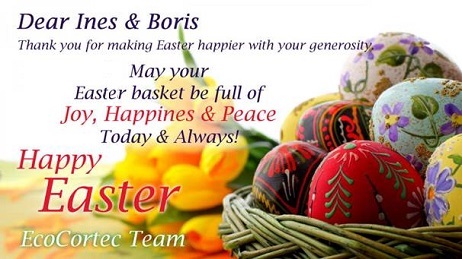 Many thanks to Boris for his hard and devoted work and we wish him to keep it up. For others, more luck next year! Our President/CEO, Boris Mikšić and his wife Ines sent everyone good wishes, thanked them for their good work and wished them the best time. Later the families of EcoCortec® team members were taken on a tour of the plant and shown the Production Area, Office and our Lab. For the kids an especially fun part was when our lab technician Snjeza performed some experiments for them. The great atmosphere continued until the late afternoon and everybody is already looking forward to repeating it next year! Cor-Pak® Stretch Film from EcoCortec® - New Formulation that will Conquer European Market ! We are proudly announcing that our long awaited, new improved formulation of Cor-Pak® machine grade and hand wrap stretch film has been successfully extruded in EcoCortec® plant, Croatia, using new construction, based on high-tech resins. Today when Croatia is entering European Union, at EcoCortec® we are happy to offer this newly reformulated Cor-Pak® VpCI® Stretch Film to our distributors. Cor-Pak® VpCI® Stretch Film provides more efficient and cost effective corrosion protection solution for primary packaging and unitization. It is the only product in the world that offers both vapor phase and contact protection to multi metals! Advantages and benefits of this film are so numerous that it simply MUST become a bestseller and help regain VpCI® Stretch Film business that was lost in the past. This improved film will help our distributors grow their market shares significantly, especially in the steel business throughout Europe. With help from our young and energetic EcoCortec® staff - sales of our packaging products in Europe are set to rise and we are calling upon our distributors and reps to take full advantage of this undeniably excellent new packaging solution immediately and regain old as well as conquer new packaging markets. Having a manufacturing plant in Europe gives huge, undeniable advantages like control over quality, price, and timely delivery. Our team is here to help you increase your profits and place this new film on the market. EcoCortec® in Beli Manastir, Croatia, is ideally situated to provide for all your sales needs. With new reformulated Cor-Pak® VpCI® Stretch Film our plant has absolutely no relevant competitor in Europe! Cortec® Receives The Materials Performance Reader's Choice Innovation of the Year Award! Cortec® is the recipient of a 2013 MP Readers' Choice Innovation of the Year Award for our PTC Emitters. The award recognizes Cortec's development of this innovative, environmentally friendly, corrosion-inhibiting product. Boris Miksic, President/CEO of Cortec®, was presented the trophy during the NACE CORROSION 2013 Conference and Exhibition in Orlando, Florida on March 18th. This recognition will also be announced in the April issue of Materials Performance Magazine. MP Readers' Choice Innovation of the Year Award winners are determined by the number of votes received from readers of MP Magazine who vote online for their favorite innovation. Cortec® wishes to thank everyone who voted for our invention. Beautiful Severn Bridge in Wales, England (pictured left) is a cable stay bridge maintained by the UK Highways Agency. The suspension cables on this type of bridge are known to corrode over a long period of time. World-renowned bridge design engineering firm Mott MacDonald has specified PTC Emitters for this project because of their effectiveness, ease of application, and low overall cost of corrosion protection. Cortec® has been engaged in the development of corrosion control products and systems since 1977. PTC Emitters are one of over four hundred effective rust prevention products that Cortec® makes to serve the Construction, Packaging, Petrochemical, Electronic/Electrical, Metal Working, Automotive, Marine, and many more industries. Cortec's newly reformulated Cor-Pak®VpCI® Stretch Film provides a more efficient and cost effective corrosion protection solution for primary packaging and unitization. This stretch wrap, produced by Cortec® Corporation and EcoCortec® (a European Subsidiary of Cortec®Corporation), is the only product in the world that offers both vapor phase and contact protection to carbon and galvanized steels, aluminum, copper, brass, zinc, and other metals. This fully recyclable film delivers added puncture resistance and load holding, allowing users to down-gauge while still containing aggressive loads and producing a better package at reduced costs. Protective packaging is important when you're dealing with stretch film and making sure containers stay on the pallet is paramount to quality control during shipping and warehouse distribution. Stretch wrapping is the most cost-effective way to keep loads secured and Cortec's Cor-Pak® VpCI® Stretch Film offers you everything you've been looking for in a corrosion protection and pallet wrap product rolled into one. This Cortec® product gives you improved handling stability when forming a unit load while also providing tamper resistance, more efficient storage, and dust and moisture protection. Cortec® Corporation's VCI/VpCI® Vapor Detection Test Kit™ presents a simple way to provide chemical analysis of the Vapor phase Corrosion Inhibitor (VCI/VpCI®) that you use in reducing the impact of your corrosion-related issues. Sophisticated corrosion inhibitor test methods, typically designed to reproduce the most extreme conditions in a system, have been employed to test inhibitor capabilities in elaborate laboratory apparatus, yet not many easy to use test methods are offered for testing of corrosion prevention performance. However, correlation of laboratory and fieldtesting are now possible from Cortec's Laboratories. The VCI/VpCI® Vapor Detection Test Kit™ is specifically developed for detecting the presence of VCI/VpCI® inhibitors emitted from various corrosion inhibiting products: paper, foam, powders, oil- and water- based rust preventative, water-treatment products, etc. The kit contains enough strips and solution for 50 testings. It comes with a one liter jar with lid, VCI/VpCI® Test Strips, VCI/VpCI® Test Solution, and a test specimen. To use the kit, place the test specimen in the jar, dip a VCI/VpCI® test strip into the VCI/VpCI® test solution, attach the top of the strip to the inside of the jar lid and immediately screw the lid on tight. Leave the test setup sit until the color changes from blue to pink. Approximate time frames for test completion under room temperature are listed in Table 1. To accelerate the test, setup may be placed in a 40°C oven. •	Finished products: engines, machinery, equipment, tools, hardware, appliances, instruments, motors, etc. Record Visit and Record Fun at European Sales Meeting in Croatia! Beautiful Croatia has once again proven that a small country can produce big fun! The EcoCortec team was happy and honored to welcome the record breaking number of attendees to this year's European Sales Meeting. Seventy guests operating in fifty seven countries throughout Europe, China and the Middle East came to Croatia's capital, Zagreb. On October 10 the meeting started at the five star Hotel Westin with a welcoming cocktail reception. We gathered with our colleagues, happy to see our long standing friends again and to meet some new associates. The next day the meeting kicked off with a short film showing the biography of Boris Miksic, Cortec's President and CEO. This year being Cortec's 35th anniversary, Boris Miksic remembered in his presentation, Cortec's journey throughout the years from its humble beginnings to becoming a global leader in corrosion protection. Educational presentations and sessions were featured by Cortec/EcoCortec team members and our distributors, highlighting Cortec's products, technologies, the latest developments, and successes. This special day ended in best way possible - at a birthday celebration for our president/CEO Boris Miksic, at Šestinski Lagvić, Zagreb's famous restaurant serving exceptional traditional Croatian cuisine and live music. It's hard to describe the atmosphere, but the fact that singing and dancing went on long into the night says it all! On October 12th all the participants were taken to Beli Manastir where a tour of the EcoCortec facility was conducted and wrap up sessions and distributor presentations were held at Patria hotel. Both Cortec and EcoCortec presented awards for best European sales, fiscal year 2011/2012. The winners were Corpac, Germany, for Cortec and Tribotec, Sweden, for EcoCortec. Once again, congratulations to the winners and keep up the good work! The festivities ended with a party at restaurant Josic, featuring local specialties from the Baranja region. Tamburitza band once again managed to keep everyone up and dancing to the Croatian local songs, Russian Kalinka, and many others. One of the most fun moments was a surprise when Ines' "Third Wife" brand of organic, genuine peach schnapps, produced at Boris and Ines' Peach Hill Farm, was given to all the attendees. In 2011 after 135 missions and 30 years of service, NASA retired its space shuttle fleet. Endeavour, launched on 25 missions and flew 122.8 million miles (197 million kilometers), is the last space shuttle to go to its final landing. It will now be permanently displayed in its new museum home at the California Science Center, Los Angeles. Cortec® has been right there helping the U.S. Space Shuttle Program protect Endeavour and the other shuttles from corrosion with VpCI®–101, 105, & 111 Emitters, VpCI®-368, VpCI®-238, and VpCI®-126 Film. For deep storage applications MilCorr® and CorrLam® were also used. The agency retired the fleet last summer to spend more time and money developing new vehicles and rockets for deep-space exploration to reach destinations like Mars. The Shuttle Program may now be history but the future of the U.S. Space Program is right before us and Cortec® is blasting off with it! Like "Blue Ocean Strategy" (W. Chan Kim & Renée Mauborgne) as space gets crowded, and prospects for growth are reduced NASA is ready to leave the Red Ocean (earth orbit) behind and is starting into the Blue Universe (Deep Space) – the unknown, defined by untapped space, knowledge, and the opportunity for growth. Cortec® will be present, as NASA creates the future of space exploration, with our tried and true corrosion control products. And, Cortec® will continue developing new, cutting edge, and innovative products to offer as technology advances farther into the cosmos. Cortec's VpCI-125 featured in Packaging Digest Magazine! EcoCortec® is very happy to be exhibiting at FachPack (Hall 5/Stand 5-350) - one of the leading trade shows in Europe dealing with packaging. Trade show will be held at Exhibition Centre, Nürnberg, Germany, 25 - 27 September 2012, with around 1,400 exhibitors and more than 35,000 visitors from packaging, technology, processing and logistics segments expected. Numerous issues, such as saving space, energy and material are current concern of the packaging industry. Market is craving for environmentally friendly innovations such as biodegradable and anaerobic digestion materials, considering that waterways all over the world are vastly polluted by plastic being discarded at sea. Because of the growing pollution and plastic debris in the oceans and fresh water, plastic bag and film usage is becoming legislation-restricted and there is a growing demand for a durable film materials that are also marine biodegradable. Marlin Darlin, a rare fish and a symbol of the Blue Oceans. Boris Miksic, CEO of Cortec has been trying to catch it for 15 years! Since half the world’s catch of this rare fish takes place in the Hawaiian archipelago, he decided to try there again. After picking the lucky boat in Honokohau Marina, Boris and his crew tried their luck and sailed off. At one moment big swordfish jumped several meters high into the air. After fighting the fish for some time like in Hemingway's novel, Boris managed to catch it. It’s hard to describe the feeling when returning back to the marina flying the blue flag with a swordfish aboard. Other boats had red or green flags, but Marlin was the king! The fish was donated to the homeless and the memories and the sword flew back to Croatia with the “lucky four”. Visit EcoCortec® at FachPack and Learn About New Revolutionary EcoOceanTM Technology! "Have you ever told yourself that one day you would tell off your boss and start from the beginning, building your own dream? 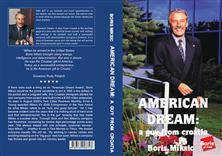 Boris Miksic is one of the relative few who made that dream come true for him when he quit his job and that same year started his own company." - Dan Heilman, Twin Cities Business Magazine, January 2012. Climb to the Top with EcoCortec! The will to win, desire to succeed, and urge to reach full potential… these are the keys that are unlocking all doors for our European Sales Team! With help from our young and energetic EcoCortec® staff - sales of packaging and corrosion control products in Europe are set to rise; will you be the one to achieve the highest goal this year? Having a manufacturing plant in Europe gives huge, undeniable advantages like control over quality, price, and timely delivery. Our team is here to help you increase your profits and respond to virtually any request. 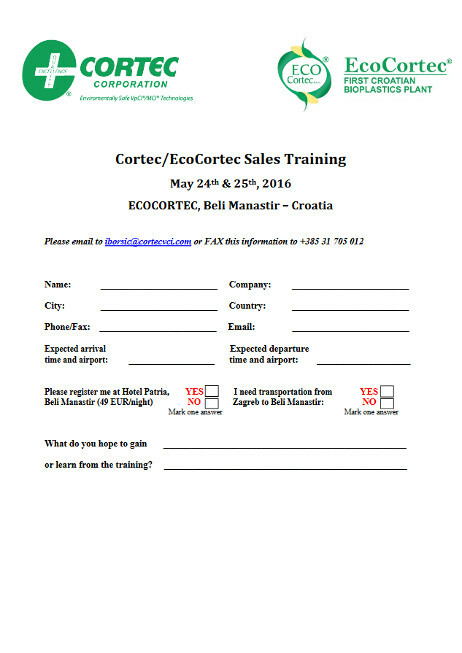 EcoCortec® in Beli Manastir, Croatia, is ideally situated to provide all your sales needs. With the most sophisticated equipment, reliable customer service and 20% yearly sales increase, this plant has no relevant competitor in Europe! The only European competitors to sales of similar products do not manufacture their own goods, they are just brokers. At EcoCortec®, we are especially proud of our products being recognized and chosen among competition by European Agency for Competitiveness and Innovation. The plant manufactures first marine degradable film in Europe - Eco Ocean, as a part of EU-financed, 1,1 million EUR worth, multinational project "Marine Clean". This latest success is just another confirmation of unmatched quality of EcoCortec's solutions on the market. Cortec's ISO/IEC-17025 accredited Laboratory has done extensive research on competitive film products and has reported these findings in reports which are available for your use on the Cortec website under "Cortec vs. Competition". Whether you sell Cortec packaging, coatings, additives, water treatment, or powder products, analyze which emerging markets are rising to increase your share of sales. Don't use the cautious approach, exceeded expectations. Overachieving is no guarantee of success, but not trying is a handicap. There is a great European Sales Team in place to help you with your ideas and give you direction. As you aggressively drive up your market share, use their help for your research and planning to capture your target markets. Aim for those new and lost markets to push your profits up and achieve growth by mapping out a distinct business model. Reinvent your sales delivery and let your customers know all the benefits of purchasing Cortec products. Use global market research companies such as The Freedonia Group or Markets and Markets (M&M) to obtain a reliable assessment of an industry, market forecasts, industry trends, threats and opportunities, competitive strategies, market share determinations and company profiles. Use everything that is going for you, and that is plenty, and remember either you run the day or the day runs you! Cortec® Corporation, a global leader in eco-friendly materials protection technologies, introduces EcoWorks® AD, biobased film and bags for the compost and anaerobic digestion markets. After years of development by Cortec's extrusion plants in Cambridge, MN and Beli Manastir, Croatia, EcoWorks® AD offers a combination of environmental and performance advantages that other films have yet to provide; heat, moisture, and chemical resistant. Cortec® EcoWorks® AD bags are constructed from the latest biobased polymer containing 77% biobased content and are designed to biodegrade in anaerobic digestion, natural soil,marine or water environments, backyard composting systems, and municipal composting facilities. In anaerobic digestion (AD) the film breaks down in as little as 15 days. To learn more click here. EcoCortec® is proud to support a new innovative project initiated by the Faculty of Mechanical Engineering and Naval Architecture University of Zagreb, one of the oldest and largest among related faculties in the region. Ever since its first courses were taught at the Royal School of Engineering in 1919, the Faculty has excelled in creating successful synthesis of general and specialized knowledge and expertise. It is also among first Faculties in the region that was homologated under Bologna Convention. University of Zagreb, as Croatia's largest University is country's innovation center where new ideas and technological solutions are being created. In July of 2012 a new system of waste management was introduced. To learn more click here. VpCI®-325 is a safe, convenient, environmentally friendly and ready-to-use liquid, based on a vegetable derived, biodegradable oil. It is used for general purpose corrosion protection in a wide variety of applications. VpCI®-325 works as an excellent lubricant and performs effectively even under the adverse condition of 100% relative humidity and in the presence of such corrosive elements as chlorides, hydrogen sulfide and other sulfur compounds. The Croatian Army was looking for solutions to remedy corrosion problems out in the field. These problems were hindering immediate combat readiness. Their tanks were especially affected by the corrosion in several areas throughout the country.VpCI®-325 was used to protect all shafts bearings, machined surfaces and other unpainted internal surfaces. Cortec® has been used by the Croatian Military for several corrosion solutions with proven success in 9 of the world's 13 climate zones present in Croatia.Cortec® also supplied step by step application instruction and laboratory technical assistance to the application team which insures proper product application and warranty validation.VpCI's give militaries world wide effective corrosion protection with immediate combat readiness. This innovative product forms a film on the metal surface and protects in two ways: first, oil-soluble safe corrosion inhibitors offer a tenacious film which clings to metal surfaces. In addition to this filming barrier, Vapor phase Corrosion Inhibitors are released into the air above the oil. These vapors condense and form a protective barrier on surfaces not contacted by the liquid product. The combined action provides complete protection for internal system parts. VpCI®-325 also provides dependable and complete water displacement from the metal surface to prevent corrosion. VpCI®-325 can be used to protect sheet metals, wire, pipes, flanges and other fabricated and/or machined parts, guns and a host of other products. It is excellent for; maintenance, lubrication, temporary storage, small or complex metal parts, home repairs of squeaky items and many more. Rust preventative will provide universal corrosion protection up to 24 months for ferrous metals, galvanized steel, aluminum, brass, copper, babbitt, zinc, cadmium and silver. It loosens frozen and rusted metal parts, making them easy to remove. The product conforms to military specification MIL-C-81309E, NACE Standard 0487-2000 and is RoHS compliant. for Salt Water and Brines! Environmentally Friendly Corrosion Inhibitor for Salt Water and Brines! Cortec®'s VpCI®-149 is a new and unique corrosion inhibiting paper for the protection of a wide variety of metals. This environmentally safe, non-toxic paper is formulated for extra protection of sensitive metals such as copper, aluminum and cast iron, providing a superior level of VpCI® protection compared to other VCI papers. Manufactured using a natural kraft paper, the coating provides a very soft and conformable feel to the paper, making it easy to use when individually wrapping parts. The strong vapor phase protection makes it a great product for interleaving and protecting void spaces. Since it is not a saturated paper, VpCI®-149 will not tear like many other VCI papers. It is made from the highest quality neutral natural kraft paper, without the use of chlorine or other chemical bleaching, which eliminates package contamination. This fully recyclable and repulpable paper does not contain nitrites, phosphates, silicones, chromates, or other heavy metals. VpCI®-149 is easy to use, there are no chemical concentrations to calculate, no chemical tanks or application systems to maintain. Just wrap your products in the paper, and fold edges together. The VpCI® coating on the paper vaporizes, reaching all metal surfaces to provide complete corrosion protection. VpCI®-149 can be used for a variety of applications like protection of products for storage and shipment in several ways: the 149 Kraft wrap for single item packaging or interleaving, end closures for shipping tubes, insert strips for recessed areas in large packages and as sheet liners or separators between products. Other typical applications include: metal producing, metal forging and die casting; raw and machined forgings and castings, metalworking such as; stamping, sheet metal work, springs, bearings, fasteners, tube, pipe, nails ect. It can be used for finished products; engines, machinery, equipment, tools, hardware, appliances, instruments, motors as well as for electrical and electronic components. VpCI®149 protects ferrous and non-ferrous metals, it is very effective against aggressive environments including humidity, SO2, H2S, and galvanic corrosion from dissimilar metals. Protective layer does not need to be removed prior to further surface finishing or coating application. Product conforms to military specifications MIL-P-3420E, NACE Standard RP 0484-2000 and is RoHS compliant. Packaging and Corrosion Protection in One Step! St. Paul, MN (July 6, 2012) – Grafem, a family owned corrugated paper packaging company based in Maribor, Slovenia, has received a supply contract for development and production of CorrTainer, a Cortec Corp. product. The non-toxic, recyclable, and repulpable CorrTainer is a coated and moisture resistant Vapor phase Corrosion Inhibitor (VpCI) barrier. The CorrTainer deal was a deal between Grafem and EcoCortec, a Cortec business unit that manufactures biodegradable films and bags in Central and Eastern Europe. "CorrTainer saves a lot of precious time and manpower, no prior preparation or secondary packaging is needed, and more importantly, it is low in cost, which makes it an ideal packaging choice for our customers," Jozef Cvetko, Grafem CEO, said. "We are thrilled that our cooperation with Cortec has resulted with this remarkable product and hope that its good market acceptance will be encouragement for future projects between the two companies." ProPack VCI film failed to provide vapor and contact corrosion protection and provided insufficient barrier protection. We are proud to inform you that the Grafem company, from Maribor, Slovenia has received a supply contract that enables development and production of one of the most economical packaging solutions on the market – CorrTainer® - a brand new Vapor phase Corrosion Inhibitor (VpCI®) barrier coated moisture resistant container, all in one box! It is non-toxic, fully recyclable, and repulpable. The CorrTainer® contract is a product of successful cooperation between EcoCortec® and Grafem. This cooperation started three years ago when EcoCortec® recognized a quality business partner in Grafem, targeting the market of Central and Eastern Europe. Grafem, a well organized family owned company, manufactures high quality products such as CorrTainer® and is successfully placing it on the market in cooperation with Cortec’s European distributors and business partners that have been developed over the last 30 years. “CorrTainer® saves a lot of precious time and manpower, no prior preparation or secondary packaging is needed; and more importantly it is low in cost, which makes it an ideal packaging choice for our customers. We are thrilled that our cooperation with Cortec® has resulted with this remarkable product and hope that its good market acceptance will be encouragement for future projects between the two companies” said Mr. Jozef Cvetko, CEO of Grafem d.o.o. In 2011, Grafem moved into a new facility and increased their manufacturing capacity. Their state of the art laboratory is designed specifically for quality testing of CorrTainer®. One of the first customers for CorrTainer® is a major supplier of oil field equipment from Romania that buys the product from Cortec's longtime partner and distributor Cortrom, Romania. Marine Clean presented in Croatian Chamber of Commerce! On April 19th, EcoCortec d.o.o., one of the most advanced manufacturers of biodegradable packaging in Europe, welcomed an international consortium of representatives of the Marine Clean project. Marine Clean -'Marine debris removal preventing further litter entry', sponsored by CIP Eco-Innovation Program, is being conducted by European Agency for Competitiveness and Innovation, EACI. The goal of CIP Eco program is to prevent or reduce hazardous environmental impact, as well as promote sustainability and innovative technologies. This project includes 8 partners from Croatia, Slovenia and Lithuania. It is being conducted through seven different work packages that are coordinated by the Slovenian company, Turna. Two days of meetings covered progress reports on work that has been carried out in the first six months of the project. Plans for future work also have been set. After the official program, the first day of meetings a visit to the EcoCortec plant was organized. Boris Miksic owner and the President of the Board welcomed our guests and then presented biodegradable film production capabilities and EcoCortec's world-class laboratory. The evening ended in the famous Josic ethnic restaurant with live tamburitza music. We were happy to receive a warm invitation from the Mayor of City of Beli Manastir, Mr. Ivan Doboš, who welcomed us at his offices on April 20th. Valuable information on the investment opportunities in the business zone of Beli Manastir were exchanged. The importance of the development of new technologies, and possibilities of contributing to economy growth, specifically in countries like Croatia, were discussed. The meeting coincided with The Green Day in Croatia, initiative during which the Government organized a major cleaning of nature collecting approximately 47 000 kg of waste. The Marine Clean group also visited Kopački rit Nature Park located in the northeastern part of the Republic of Croatia. This is an exceptional floodplain with great biological diversity. The whole event had great media coverage on national TV, regional radios station and daily newspapers identifying this important project for the region and also for the country of Croatia. Picture 3: Close-up of digestate in the segregated blue bin. White specs in the photo identified as mold. converting compostable waste to fuel (or feed) in UW Oshkosh's first-of-its-kind dry fermentation anaerobic biodigester. Based on preliminary testing, Cortec's EcoWorks® AD bags are passing the expectations of the tests. an example in reducing dependence on fossil fuels and moving in the direction of energy independence. systems, and municipal composting facilities. In anaerobic digestion (AD) the film breaks down in as little as 15 days. EcoWorks® AD has also been awarded USDA Biopreferred designation for Packaging Materials (www.biopreferred. anaerobic digestion programs. 100% anaerobically digestible per ASTM D5511 standard test method. Dissipative Film and Bags Bestseller in Electronics Packaging ! Cortec presents VpCI®-125 - patented static dissipative film and bags unique in their ability to prevent corrosion and ESD damage. This non-toxic film combines the latest plastic technology with effective corrosion protection of sensitive electronics equipment and components for different metals. It is the first commercially produced static dissipative film powered by Nano-VpCI technology. Through years of testing, Cortec's scientists discovered synergistic effect between ESD additives and VpCI® masterbatch that are otherwise non-compatible. 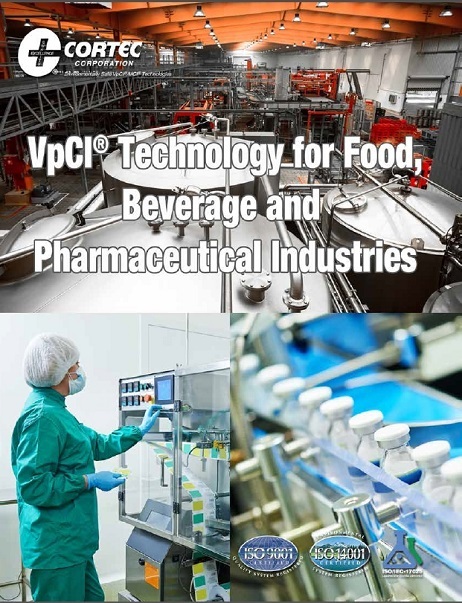 Using high-tech coextrusion equipment, VpCI®-125 is produced and converted in two state of the art plants located in the United States and Europe for leading electronics companies around the world. VpCI®-125 is used by world leading electronical companies like are Nortel Networks and Motorola Inc. Motorola wanted cost effective and less time consuming method of export packaging. VpCI®-125 Antistatic bags were selected and placed over the enclosures resulting in better protection, reduction of packaging material and labor. VpCI®-125 has become the bestseller in electronics packaging business by offering economical, aestetically attractive packaging system to replace expensive vacuum aluminum foils, desiccants, multi layered barrier films, chemical sprays, etc. The product is ROHS compliant and fully recyclable. It provides vapor phase and contact protection to multimetals with strong and longlasting static dissipative properties that are independent of relative humidity. This strong puncture resistant film replaces conventional rust preventatives such as oils and desiccants. It enables the customer to reduce costs because Cortec VpCI® packaging eliminates all the degreasing or coating removal required in the past and can be used immediately. Nortel,the largest company in Canada who ships electronic equipment worldwide, switched to Cortec products to solve their corrosion problem. Electronic equipment was simply wrapped inVpCI®-125 Antistatic film, and VpCI®-132 pads were added into each package to provide extra corrosion protection. Nortel experienced substantial cost savings in their process by using two rather than three products, and eliminating the use of a vaccuum. The static dissipative properties of VpCI®-125 are humidity independent; its unique composition does not require the presence of moisture to function.VpCI®-125 does not contain free amines, phosphates, silicones and other harmful materials. VpCI-125 conforms to MIL-81705D Standard for Static Dissipative Packaging Materials Type II, Mil-B-22019F Standard for Corrosion Protective Packaging Films, NACE 00487/2000 Standard Recommended Practice for Temporary Corrosion Protection and German Standard TL-8135-002 for VCI Films. Dr. Rita Kharshan – Guest Lecturer at Zagreb University Seminar! The seminar "Corrosion Inhibitor in Metal Structures Protection" was held at the Faculty of Mechanical Engineering and Naval Architecture, University of Zagreb, Croatia February 15, 2012. Special guest lecturer Dr. Margarita Kharshan, head of Cortec's Research Laboratory in St.Paul, MN, USA and one of the top scientists in the field of volatile corrosion inhibitors held the presentation "Corrosion Inhibitors in 21 Century. " Dr. Kharshan demonstrated the use of new generation corrosion inhibitors for different industries. This hands on seminar was held to show practical application and testing. The seminar was especially designed for Engineers, Technicians, and Production Managers dealing with the maintenance and protection of metal structures against corrosion. Attendees had the opportunity to deepen their knowledge about the most recent trends in the area of inhibiting corrosion caused by various aggressive environments. The technology behind inhibitors and the advantages of their use is still insufficiently known in Croatia and as a result this subject initiated great interest among industry experts. After an introductory speech by Faculty Dean, Ivan Juraga, scientists and businessmen lectured and shared their experiences with corrosion inhibitor technologies, their utilization, and functionality; with Cortec's products highlighted as the most efficient inhibitors on the market. This was confirmed by important Croatian companies like TPK, Zagreb, whose employees gave a presentation using Cortec's products and confirmed their excellent performance. During her lecture, Dr. Rita Kharshan placed special emphasis on Cortec's latest and most advanced, innovative and environmentally responsible VpCI technology. Unlike traditional hazardous petroleum based products, Cortec's inhibitors are characterized by their high biobased content, sustainability, and high performance. The successful presentation was followed by numerous questions and interesting discussion. PRESS RELEASE: Dr. Rita Kharshan – Guest Lecturer at Zagreb University Seminar! PRESS RELEASE: 100% Biodegradable VCI Film Protects Metal Parts Featured in Packaging World Magazine! Eco-business:EcoCortec - Partner in EU Financed Eco Project 'Marine Clean'! Please find complete report on the link below. EcoCortec - Partner in EU Financed Eco Project 'Marine Clean'! Packaging-Europe:EcoCortec - Partner in EU Financed Eco Project 'Marine Clean'! Eco Cortec - Partner in EU Financed Eco Project 'Marine Clean'! Cortec® Corporation Announces VpCI®-126 TRF: An Anti-Corrosive Film That Stands Up To The Heat Of Industrial Work. Around the world, metal products need to be protected for shipping and storage as soon as possible. When these products come out of production, they can still be very hot and require cooling before packaging. VpCI®-126 TRF (Temperature Resistant Film) from Cortec® Corporation offers a world-renowned anti-corrosion film resistant to temperatures of up to 170°C (338°F) so parts can be packaged with less cooling resulting in a reduction of cycle time. The temperature resistance makes the product ideal for use in foundries, hot mills, and for parts that are heat-treated. Building on Cortec's best-selling Vapor phase Corrosion Inhibitor (VpCI®) technology, VpCI®-126 TRF offers excellent corrosion protection for a variety of applications. The VpCI® molecules vaporize and form a protective shield around stored parts with or without direct contact with the surface. Vapor phase protection ensures that materials stored using the film are protected from corrosion, even down to the smallest nooks and crannies that traditionally used anti-corrosive coatings can't reach. Traditional anti-corrosive coatings require messy clean up before materials are usable. When those same materials are stored in VpCI®-126 TRF they are ready to go at any time with no need for cleaning. Inspecting stored materials is simple because the film is transparent. Production process speed is further increased by the reduction of required cooling time. Metal parts can be packaged sooner than they could with regular polyethylene films thanks to VpCI®-126 TRF's superior heat resistance. VpCI®-126 TRF is excellent for protecting aluminum, carbon and stainless steels, and yellow metals from corrosion, and is fully recyclable. Innovation with a Marine focus. Minnesota Zoo Composting Program - launched with Cortec's Eco Film®! The Minnesota Zoo belongs to a top ten zoos in North America and is a home to more than 3700 animals. Cortec® Corporation, a champion in green and environmentally responsible technologies is very proud of it's contribution to the Minnesota Zoo Green Program, which foucuses on conservation and sustainability of natural resources. In an effort to conserve these resources and minimize waste, The Minnesota Zoo is incorporating "green" practices into its design and every day operations . The Zoo recently formed a Green Team, whose main goal is promoting activities aimed at sustainability. One of the initiatives lead to development of a composting program that greatly reduces the amount of waste generated. The program was implemented in the spring of 2011, using Cortec's Eco Film®, a 100% biodegradable and compostable film, designed specifically for the unique demands of compost programs. Eco Film® replaces non-degradable starch and polyethylene- based films, and is up to 300% stronger than polyethylene. As part of their Green team initiative, the Zoo recycled 370 tons of material, and composted about 600 tons of waste just last year! The program generates a great quantity of finished compost which is then used as a soil mix additive and as mulch on existing turf areas. It's goal is to divert food waste at the zoo, and reduce the trash that is taken into area landfills. The zoo will be selling finished compost in the bulk to the public, which will be used as fertilizer for crops, farms and gardens. This concept of reusing, composting and recycling of materials is applicable to all kinds of large gathering places. Venues where large volumes of food is consumed lead to large quantities of organic waste. This includes stadiums, national parks, amusement parks, cruisers, fairs, large resorts, hotels and many more. Before starting the composting program, the zoo tested all certified commercially available compostable plastics from various manufacturers. According to Brenda Teats (Director of Corporate Giving, Minnesota Zoo), “Staff tested a number of different compostable bags, and the ones from Cortec performed by far the best“. Now, Eco Film® bags are used for food waste created by employees, staff, their catering service, as well as during summer Zoo Camp – with plans to expand to common areas soon. EcoFilm bags in use in food service area of the Zoo. about sustainability.“It is more important than ever that people make prompt decisions which will help to avoid the effects of plastic pollution. As a company determined to make a positive impact on the environment, we hope that the Minnesota Zoo Green Program will positively influence many other communities throughout the world to take actions and encourage this kind of green projects. Cortec's EcoLine® Coatings- Green Replacement for Toxic Mineral Oils! EcoLine® 3220 and EcoLine® 3690 are biobased and biodegradable coatings, developed to replace traditional oil based rust preventatives. Both products are designed for extended temporary protection of multimetals, and if needed could be easily removed using a biobased Ecoline Surface Cleaner/Degreaser, eliminating expensive disposal costs associated with oils. They provide excellent corrosion protection while being environmentally safe and completely non hazardous. EcoLine 3220/3690 are improved replacements for flammable solvents and petroleum based products which will continue to escalate in price. They are functionally superior and cost efficient, and at the same time completely safe to work with. They conform to NACE Standard RP0487-2000. EcoLine® 3220 - is a canola-oil based addition to our biodegradable line of products made with renewable resources. It is a ready-to use temporary coating that offers a tenacious film which clings to metal surfaces, providing excellent contact corrosion protection in storage and shipment. In addition EcoLine® 3220 provides long lasting vapor corrosion inhibition, as well as great balance of corrosion protection and lubrication. Product is intended for indoor or sheltered protection for up to two years. Difference in test results using Naphtenic oil and Ecoline 3220. EcoLine® 3690 - offers an open air corrosion protection and is excellent replacement for more expensive polluting solvent based rust preventatives such as Tectyl and Cosmoline. Made from renewable materials and containing canola oil as a carrier, it has an excellent thermostability and no effect on rubber, plastics or paints. This coating is designed for marine and high humidity conditions. The film is self-healing and moisture-displacing, providing superior protection against aggressive environments. Test results show samples treated by plain oil and Ecoline 3690. Cortec® VpCI® papers provide multi-metal protection in simple, economical applications for both ferrous and non-ferrous metals eliminating the need to inventory a variety of papers for each of the metals you need to protect. They prevent package contamination by utilizing only the highest quality neutral/natural Kraft paper produced in our own state-of-the-art coating plant under controlled conditions, with full time quality control and research ISO/IEC 17025 accredited laboratory. All Cortec® VpCI® papers are environmentally safe, fully recyclable and repulpable, biobased,nitrite free, non-toxic, and FDA approved. They provide an excellent alternative to oil coatings or other VCI/VPI papers that contain hazardous chemicals. protected products can be used immediately – no surface preparation or cleaning is required. Cortec® range of environmentally safe VpCI® papers are available in jumbo or converter rolls,standard size rolls, and sheeting as well as custom printing and converting. • VpCI®-144 – A moisture barrier coated paper. Replaces polyethylene coated papers. • VpCI®-146 - Protects products for storage or shipment. • VpCI®-148 - Provides resistance to greases, oils, and solvents. metals such as copper, aluminum, and cast iron. • EcoShield® Linerboard, Patented- Provides a moisture and oil barrier protection. precious metals such as silver, gold, and tin. Boris Miksic, CEO of EcoCortec and Mrs Nevenka Topic and Mr.
juices. EcoCortec and Eko Vrelo are hopeful by leading by example,other local businesses will soon join the sustainable business movement. and investments in the Beli Manastir business zone. or email info@ecocortec.hr for EcoCortec d.o.o. or email info@ekovrelo.hr for Eko Vrelo d.o.o. 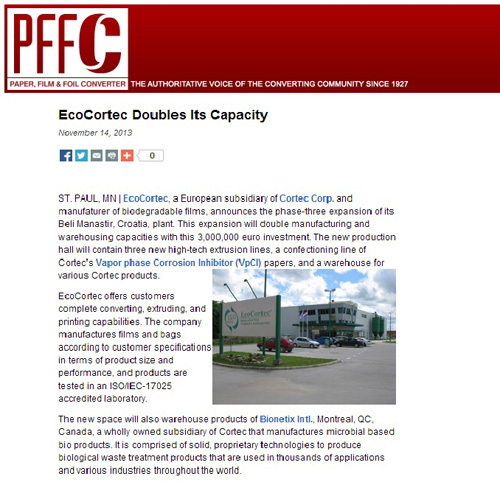 Cortec's Eco-Corr Film® Featured in BioPlastics Magazine. LOWELL, Mass., July 26, 2011 – Telles, a joint venture of Metabolix, Inc. (NASDAQ: MBLX) and Archer Daniels Midland Company, today announced that Cortec® Corporation, a leading film producer located in St. Paul, Minnesota, has selected Mirel™ bioplastic for a new line of film products. Through a mutual development and commercialization effort, the two companies have developed proprietary processing and extrusion methods resulting in the first commercially viable finished flexible film products made from the new biobased Mirel P5001 film grade resin. "Our combined effort with the Telles technical team to develop a unique method of extrusion-blown film products has resulted in a process innovation," explained Boris Miksic, president and CEO with Cortec. "The combination of Mirel film resin with the new extrusion and processing method delivers practical and diverse benefits for end-users, including multiple end-of-life options." Cortec is launching two new products based on Mirel P5001—EcoOcean™ and Eco Works® AD. EcoOcean is for marine biodegradable markets and Eco Works AD is designed to meet the demands of anaerobic digestion systems, offering various disposal options for bioplastic products. Cortec’s biodegradable films are available in more than 70 countries worldwide. EcoOcean and Eco Works AD will be available through these sales channels upon launch. Eco-Corr® is a biobased and biodegradable film utilizing Cortec's patented VpCI® technology. It is the first 100 % biodegradable VCI film in the world, initiating a new era for 21st century packaging! This highly efficient product provides much better tensile strength, tear resistance and ultimate elongation than low density polyethylene (LDPE) films. It is certified under DIN CERTCO DIN EN 13432 (Europe) and Biodegradable Products Institute ASTM D6400 (USA), as well as heat and water stable and does not disintegrate or break apart while in use. Bionetix International - expands into European Market! Bionetix International; headquartered in Montreal, Canada, is now a Wholly Owned Subsidiary of Cortec Corporation in the business of manufacturing microbial based bio-products. With more than 30 years of Cortec's experience as a world leader in environmentally-safe materials protection technologies, Bionetix’s product range is a natural extension of the Cortec® product offerings. Our integrated resources will provide our customers with unique benefits of remediation, and bioaugmentation. We will continue to expand our portfolio of products and service capabilities, creating additional value for our clients worldwide. A food processing plant discharged 600 kg/day of material consisting of:50% protein, 30% vegetable oil, 20% water. BCP22 and STIMULUS were applied. Fourteen days later there was only some untreated materials due to continuous discharge. Bionetix International is comprised of solid, proprietary technologies to produce biological waste treatment products that are used in thousands of applications and various industries throughout the world. The purpose of Bionetix products is to degrade target substances in waste systems by using natural methods and develop environmentally safe manufacturing and disposal processes. Capability of microorganisms to transform pollutants and synthetic chemicals into sources of energy and raw materials for their own growth, proves that expensive chemicals can be replaced with biological processes that are lower in cost, more efficient and acceptable for the environment. Bacteria used in the Bionetix line of products degrade more complex chemicals along with higher volumes of waste materials. a) Industrial Waste Treatment - Treatment of waste water on site prior to discharge to sewage. Bacteria specifically selected to degrade target substances in waste water systems, like fats and oils, food, beverage and alcohol. b) Municipal Waste Treatment - Enhances waste treatment in municipal waste water. Reduces organic acids, ammonia and toxic substances, controls odor. Increases treatment efficiency. Reduces plant upsets from shock. c) Institutional and Household Market - Biological cleaners and janitorial applications, grease trap treatment, urinals, odour removals, disinfectants and septic tank treatment. e) Agricultural Treatments - Grow higher quality crops...have greener fairways and reduce impacts on land and dependency on chemicals and reduce input costs. Cortec® Corporation, a world leader in innovative, green, sustainable technologies has spent many years of dedicated experimentation to introduce our BioCortec® range of corrosion control products. Our mission is to develop eco-efficient products made from sustainable materials that are compostable and biodegradable; combining new technologies that have positive effects on the environment and are completely safe for the people who work with them. We strive every day towards this goal as scientists and engineers; improving our products to leave a better planet for our future generations. For several decades now, scientists around the world have been alerting us about the importance of replacing synthetic chemicals that are among major causes of pollution on the planet, with green alternatives enabled by technological innovations. Dedicated research and simply turning to nature enables Cortec® to develop new technologies that help us create bio-based alternatives that are complete corrosion control and packaging replacements for hazardous chemicals and oil derived products. Our products don't destroy the natural balance of the environment, are functionally superior, and cost efficient making them a more economical solution. • Films and Bags - biodegradable & compostable; specifically designed to replace LDPE, LLDPE, and HDPE films. • VpCI® Papers - with multi–metal corrosion control; utilizing only the highest quality neutral/natural Kraft paper; fully recyclable, biodegradable, and compostable. • EcoEmitter® - Cortec’s first product in our exciting new EcoEarth™ line of products - providing corrosion protection for electronic and optical equipment and components. • EcoAir® - an air powered aerosol replacement to traditional chemical propellants. • EcoLine® canola and soya - based VpCI® technology. • Foam Devices - made from soy vegetable oils and bio-based fibers that enable corrosion protection by emitting VpCI® molecules that adsorbing onto metal surfaces. • Migratory Corrosion Inhibitors (MCI®) - additives for concrete used to prevent corrosion of rebar; derived from sugar beets & soybeans. Croatia has officially been confirmed to become 28th member of European Union by far the strongest economy in the world. This creates enormous opportunity for EcoCortec and our European distributors to grow our market share. EcoCortec is the only producer of VpCI® films in European Union, our non-EU competitors are Zerust/Excor, Daubert, Safepack, Grofit, Magna and our EU competitors do not have own VCI film production in EU: Metpro, Brangs und Heinrich and Propack. EcoCortec is the only producer of VpCI® films and bags that has the state of the art production plant, logistics center, laboratory, marketing and customer support center and distribution network that is European Union based. Location of our EU facility in Beli Manastir, Croatia, EU has been carefully chosen as it is located at the crossroads of East and West Europe. Recently finished Corridor C-5 that our plant is adjacent to is the truck superhighway of Europe, starting in Poland and ending in Turkey. EcoCortec/Cortec family is proud to become a part of European Union business community. Europe Strives for Sustainability with Biodegradable Bags! Since the beginning of 2011, use of plastic bags has changed completely. Italians who are said to account for more than a fifth of the plastic bags used in Europe were using about 20 billion plastic bags per year. A new law banned bags that are not biodegradable and shop owners are instructed to use bags from cloth, paper or other biodegradable materials. Italian Environment Minister regarded the new law as great achievement stating that mass garbage can be reduced, littering is less and the environment will be improved in general. With this declaration Italy joined the group of countries that forbid or at least reduce the usage of plastic bags. Other European countries have surcharges on plastic bags, a measure that cuts the usage of harmful plastic materials by more than 50% pointing out besides hazardous effects, great potential of death risk for animals. In USA since 2007 plastic bags have started to be banned on local level. In San Francisco, first city that introduced such law they are forbidden in supermarkets and drug stores. After that many cities followed that example. Environmental organisations have strongly supported these policies. They indicate that in 21 first century new technologies based on sustainability have finally found a way to work in contribution to the environment instead of hazardously ruining it's natural balance. To put it more simply if we know that life lasting of a plastic bag is only 45 minutes, this means simply that it is thrown away rather than being used once again. In contrast to the usage time of a plastic bag it takes 77 million years to generate one drop of fossil fuel! Once thrown away plastic bag takes 400 years to decompose or they produce very hazardous gases in incineration plants. Turn towards biodegradable materials shows a positive trend that leaderships as well as ordinary people are becoming more aware of the importance of sustainability and preserving our natural surroundings. Cortec research laboratory devoted many years of dedicated studies to develop Eco Works® - certified biodegradable and compostable flexible films and bags designed to replace many forms of low and high density polyethylene at highly competitive pricing. Used in applications ranging from protective industrial films and agricultural films, to retail packaging and municipal waste diversion collection bags. Eco Works® is a range of formulations, that can be customized to your precise needs. When placed in typical composting environment EcoWorks® film will fully biodegrade into carbon dioxide and water within a matter of 6-8 weeks when placed in a typical composting environment. There is no ecotoxicity to the soil, plants or microorganisms involved in this process. These films have been certified 100% biodegradable/ compostable per ASTM D6400 and DIN EN 13432 by certifying agencies such as BPI and DIN CERTCO. You can't afford not to use VpCI 377! 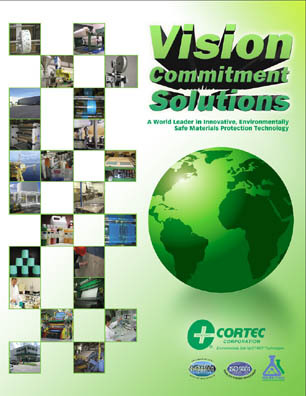 Decades of devoted research in Cortec's Laboratory resulted in products like VpCI®–377. This water-based, environmentally responsible, and low cost concentrate is designed as a complete replacement for oil-based preventives for indoor protection of equipment and components. VpCI®–377 is a corrosion preventative liquid that meets the toughest antipollution requirements. Using this product you will get a completely safe alternative that is dramatically lower in cost than classic mineral oils; while at the same time you will be eliminating all expensive disposal costs associated with oils. What is the total cost of utilizing rust prevetatives in a manufacturing environment? It is easy to look at the price per liter of one product versus another. This however, is only a small part of the total cost in using a rust preventative. You also have to consider the hidden costs associated with chemical use and disposal. These include product coverage, dilution rate, transportation costs, air permits, and disposal costs. NEWS ALERT: You can't afford not to use VpCI 377! The annual cost of corrosion worldwide is estimated to exceed 1.8 trillion USD, which translates to 3 to 4% of the Gross Domestic Product (GDP) of industrialized countries. "Cortec® Corp. leads in the number of new product developments in the corrosion protection field. From 2008 to 2010, the company accounts for 23% of all developments in the global corrosion inhibitors' market. Dow Chemical Co. holds the second largest share in number of new product developments; which accounts for 7% of all developments from 2008 to 2010. The global corrosion inhibitors market is estimated to reach $5.9 billion in 2015 from $4.6 billion in 2008, at a CAGR of 4.5% from 2008 to 2015." as stated in the research paper on "Global Corrosion Inhibitors- Water and Oil Based, Organic and Inorganic, Raw Materials Trends and Forecast (2010 – 2015)" by MarketsandMarkets Research, an independent U.S. market research and consulting company. Included in this study are the leading specialty chemical companies of the world: BASF, Dow Chemical, Nalco, Ashland, Henkel, GE-Betz, Champion, Akzo Nobel, Kurita, W.R. Grace, and others, making Cortec's leadership position a remarkable achievement. Beli Manastir, March 12th 2011. 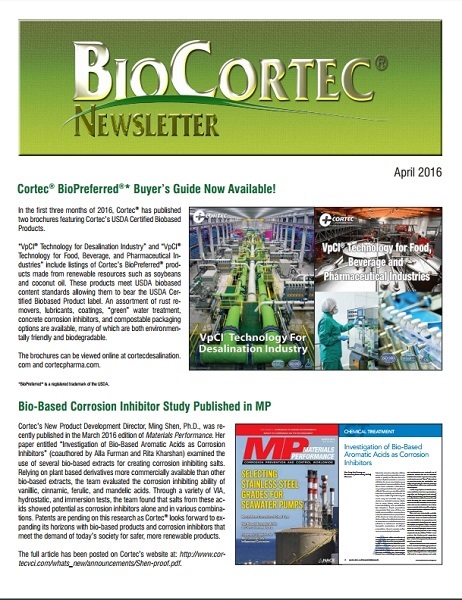 Cortec® Corporation is truly proud to present a new revolutionary product BioCorr® Rust Preventative. This waterbased, biobased, and biodegradable rust preventative is intended for the preservation of metals in storage and during transportation. It provides multi-metal protection and is an excellent environmentally sound alternative to petroleum derived products. Considering the fact that the price of oil has crossed $ 100 per barrel, astronomical increase of anti - corrosion oil prices is inevitable. BioCorr® is the solution that will initiate a new era in the ﬁ eld of corrosion protection. This ready-to-use formulation provides protection for up to two years of indoor storage, as well as for shipments when combined with VpCI® packaging materials. It is much cheaper and more effective than oil. Unlike rust preventative oils, this innovative product leaves a dry ﬁ lm on the surface of the metal that is virtually invisible. Thanks to this feature you will be able to create a clean workplace and prevent material waste. BioCorr® Rust Preventative is VOC free and the formulation is biodegradable, eliminating expensive disposal costs associated with oils. By using this outstanding preventative you will get complete low cost protection during storage or during domestic and overseas shipments, eliminating any rust claims. This environmentally friendly, 100% biobased and biodegradable product reduces carbon emissions for 70%. It provides excellent multimetal corrosion protection while combining ﬁ lm-forming additives with Vapor phase Corrosion Inhibitors (VpCIs), displaces water and oil from metal surfaces and above all, using this preventative you will be replacing hazardous mineral oils and ﬂ ammable solvents. It is VOC free and does not contain any chlorinated compounds, chromates,or nitrites and can be applied by dipping or spraying. It can be used as biodegradable preservative for machines and equipment, temporary coating for storage and shipment, protection of pipes, ﬂ anges, gears as well as for casting iron, sheets, and coils. Cortec® Corporation is a world leader in innovative, environmentally responsible VpCI® and MCI® corrosion control technologies for Packaging, Metalworking, Construction, Electronics, Water Treatment, Oil & Gas, and other industries. Our relentless dedication to sustainability, quality, service, and support is unmatched in the industry. Headquartered in St. Paul, Minnesota, Cortec® manufactures over 400 products distributed worldwide. Cortec ® European Sales Office is moving to a new advanced location! Beli Manastir, March 3rd 2011. It is our pleasure to announce that our Cortec ® Europen Sales office is moving to a new location. As of next week we will be located at Technology Transfer Center, Croatia’a most developed technological and engineering facility. This spacious new office will enable us to provide even better services to our clients. Close vicinity of the Faculty of Mechanical Engineering and Naval Architecture will enable more efficient technical support and consultance with experts in the corrosion prevention field, with whom Cortec has been succesfully cooperating for over a decade. Regarding these positive changes and progress of our company we are looking forward to all our future challenges. BioCorr ® Now Available in Croatia! Beli Manastir, February 28th 2011. We are happy to inform you that BioCorr ® Rust Preventative is now available at EcoCortec, Croatia! Currently we have available in stock 1045 liter totes of BioCorr ® . We would like to offer you a great opportunity to combine your new BioCorr ® orders with VpCI-126 and VpCI- 125 film orders from EcoCortec. This waterbased, biobased, and biodegradable rust preventative is intended for the preservation of metals in storage and during transportation. It provides multi-metal protection and is an excellent environmentally sound alternative to petroleum derived products. Considering the fact that the price of oil has crossed $100 per barrel, an astronomical increase of rust preventative oil prices is inevitable. 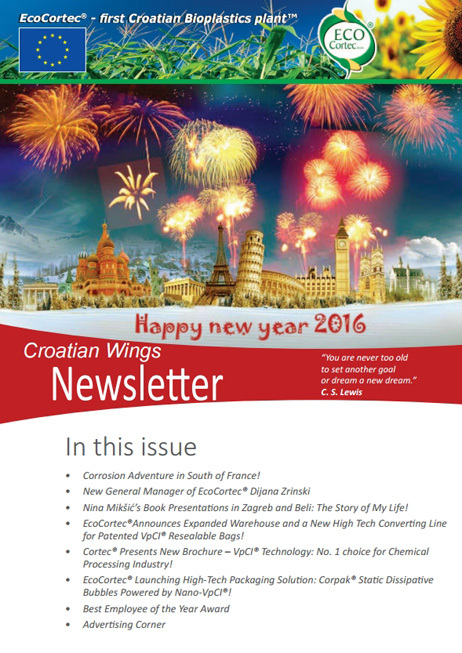 NEWS ALERT: BioCorr ® Now Available in Croatia! BioCorr ® is the solution that will initiate a new era in the field of corrosion protection. This ready- to-use formulation provides protection for up to two years of indoor storage, as well as for shipments when combined with VpCI ® packaging materials. It is much cheaper and more effective than oil. Unlike rust preventative oils, this innovative product leaves a dry film on the surface of the metal that is virtually invisible. Thanks to this feature you will be able to create a clean workplace and prevent material waste. BioCorr ® Rust Preventative is VOC free and the formulation is biodegradable, eliminating expensive disposal costs associated with oils. By using this outstanding preventative you will get complete low cost protection during storage or domestic and overseas shipments, eliminating any rust claims. This environmentally frien- dly, 100% biobased and bio- degradable product reduces carbon emissions by 70%. It pro- vides excellent multimetal corrosion protection while combining film-forming additi- ves with Vapor phase Corrosion Inhibitors (VpCIs), displaces water and oil from metal surfaces and above all, using this preventative you will be re- placing hazardous mineral oils and flammable solvents. It is VOC free and does not contain any chlorinated compounds, chromates, or nitrites and can be applied by dipping or spraying. It can be used a biodegradable preservative for machines and equipment, temporary coating for storage and shipment, protection of pipes, flanges, gears as well as for cast iron, sheets, and coils. Beli Manastir, February 14th 2011. Cortec Corporation and EcoCortec are very pleased to announce that we will be exhibiting at Interpack to be held in Dusseldorf, Germany, the 12-18 of May 2011. This upcoming event will provide an opportunity for us to interact with each other and will be a great way for Cortec to demonstrate the continual long term commitment of generating advanced and efficient products as well as to present our new, innovative, product lines. By participating, we are enhancing our marketing operations and the Cortec and EcoCortec company images throughout the European market. Dario Dell’Orto, Cortec VP of International Sales, Ines Tendler, Advisor to CEO, (fluent in German) and I will be welcoming you at the Cortec booth #-12C17-4, in the USA Pavilion, Hall #-12. Enclosed are the Interpack Site Plan and the USA Pavilion floor plan. We want to make this a splendid opportunity for our distributors to participate in discussions regarding current challenges and future plans. You, our distributors, are the cornerstone of our continuous growth and world leadership and we know you will find it interesting to take part in this event. Cortec® announces EcoEarth™ product line, EcoEmitter®, and a glimpse of the future in corrosion protection. Introducing Cortec’s newest product line, EcoEarth™, created to illustrate our continually committed resolve to make the most advanced biodegradable and compostable products, made from bio-based or sustainable resources, for your corrosion prevention needs. Thanks to continuing research, study, and experimentation, Cortec® knows more than ever before about producing ecologically harmonious corrosion control products. As technology advances, we continue to expand our unique earth friendly offerings. Cortec’s first product in this exciting new EcoEarth™ line is the EcoEmitter®, designed with the environment in mind to reduce our carbon footprint. EcoEmitter® is a highly engineered device that provides corrosion protection for your most sensitive assets such as electronic and optical equipment and components. The polymeric cup has been redesigned to replace polyethylene and is constructed from OK Biobased 3-star rated resins containing 60-80% renewable carbon content. The active corrosion inhibiting powder is nontoxic and biodegradable; each emitter is individually packaged in certified compostable film, and placed in a box containing 30% post consumer recycled content. This economical, easy to install, non-toxic device is designed to provide corrosion protection for metal components and parts enclosed in nonventilated cabinets and tool or control boxes. Each compact space saving EcoEmitter® is powered by NANO VpCI™ corrosion inhibiting technology conditioning the space and adsorbing onto metal surfaces providing a microscopic molecular layer of corrosion protection. Vapor phase molecules sublimate from the solid phase and emit through the 100% biobased breathable membrane to provide continuous long-term multimetal protection, even in the harshest conditions, for up to 24 months during operation and/or shutdown. EcoEmitters are free of nitrites, halogens, phosphates, and the VOC values meet Southern California Clean Air Act and other National and local regulations. PRODUCT RELEASE: Cortec® announces EcoEarth™ product line, EcoEmitter®, and a glimpse of the future in corrosion protection. Cooperation between industry and higher education is a common practice throughout the world and Croatia’s first bio-plastic plant, EcoCortec® d.o.o in collaboration with the Faculty of Mechanical Engineering and Naval Architecture in Zagreb hosted an educational tour for 25 (third and fourth year) students and initiated a fieldwork project of polymers processing. The visits were conducted under the leadership of Professor Mladen Sercer, PhD, Head of the Department for processing of polymers and wood at the Institute of Technology. EcoCortec® presented its high standards in the manufacturing of patented polyethylene films, based on Cortec® Corporation’s Vapor phase Corrosion Inhibitor (VpCI®) technology. The irreplaceable practical experience and enhancement of theoretical knowledge that the students gain at university classes conducted in this way enhances their overall acquired knowledge. Besides becoming familiar with EcoCortec® production processes, new innovative VpCI® technology was presented to these young, future engineers. With collaboration between education and economy, Croatia can really become a country with experts, knowledge, and the latest world technology in manufacturing; and become the regional leader in innovation aimed towards the export of finished products. Beli Manastir, October 12th, 2010. EcoCortec is pleased to announce the completion of its independent laboratory test facility! EcoCortec recently expanded its laboratory capabilities with a new chamber for the testing of ESD and antistatic properties of films. The first tests were recently completed successfully for films produced for end-users in Central and Eastern Europe. EcoCortec is a pioneer in research, development and commercialization of high technology plastics, requiring extensive investment in extrusion equipment and testing capabilities. The enhanced in-house laboratory capability reduces testing and certification lead time for customers and increases production speed of the complex polymer matrix used in Cortec’s ESD films. VpCI-125 Static Dissipative Bags and Film and EcoCorr® ESD are recommended for packaging of static-sensitive and non-static sensitive components where triboelectric charge generation and corrosion are concerns. VpCI-125 is recommended for packaging of integrated circuits, printed circuit boards, PCB components, telecommunications equipment, electronic and electrical panels, and enclosures. EcoCorr® ESD is certified compostable polymer blend that is actually stronger than low density polyethylene and offers multi-metal corrosion control and static protection. Users of EcoCorr® ESD can compost the used bags onsite or at industrial compost facilities. The specialized testing facility is another first for Croatia’s blossoming high technology industry. EcoCortec is again paving the way for Croatia to establish itself as a leading developer and producer of high quality, high technology products and services. Further upgrading of technology and intellectual achievements will follow in the form of ISO certification and formal confirmation of compliance with European standards at key customers and in third party government and university approval our products. “Croatia can truly become a leader in polymer and biotechnology research, development and commercialization. We are pleased to be paving the way by proving green business and high technology business can flourish in the Croatian economy” states Boris Miksic, CEO and founder of Cortec Corporation (USA) and EcoCortec (Beli Manastir, Croatia). To promote biodegradability and compostability on a global level, EcoCortec has donated 200,000 biodegradable bags to the “Galapagos” National Park and to the “Charles Darwin” Research Institute. EcoCortec is currently in the last stage of finalizing a contract with a top scale Croatian tourist center to supply them with biodegradable bags as well. Ecology and conservation of the planet where we live is an imperative of our time. Large amounts of plastic waste pose a major threat to the environment. Each year, 90 billion tons of plastic waste is generated worldwide. Therefore, the importance and value of biodegradable plastic is obvious. Biodegradable films and bags are increasingly used in everyday life. Australia is currently considering a law on the mandatory use of biodegradable bags and films, while the United States are in preparation of rules on labeling of packaging that is biodegradable, and compostable. European countries have also launched a similar initiative that will result in replacement of conventional polyethylene film and bags with biodegradable and compostable materials. 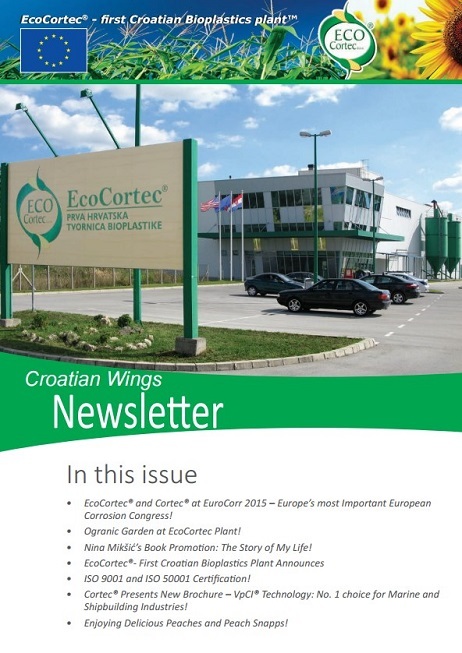 Croatia’s first bioplastic plant, EcoCortec, owned by Boris Miksic, has been in operation since 2007. EcoCortec is a greenfield investment of over 10 million Euros. The 2000 m2 production facility is located on 10,000 m2 of the industrial zone in the city of Beli Manastir. EcoCortec offers two main product lines--biodegradable films and films for corrosion protection--with the ability to customize production to meet customer design and performance specifications. EcoCortec Ltd. is a sister company of Cortec Corporation, headquartered in St.Paul, MN, USA. With over 30 years of research, development and production expertise, Cortec Corporation has created an efficient network of distributors in Europe and Asia. With global recession fears easing, EcoCortec has experienced market growth and increasing demand prompting new investments in equipment and machinery. With this new investment of two million kunas EcoCortec will double its capacity to 10,000 tons per year. EcoCortec is also investing in laboratory equipment including an ESD chamber for static decay and surface resistivity testing of their specially designed films. In addition to increasing the capacity of the extrusion line this new investment will provide for in-house recycling, reprocessing, printing and converting capabilities for biodegradable films. The continuous reinvestment in equipment and production capabilities continues as market demand increases for products that meet internationally recognized quality certifications. These recent investments and the resultant production increase will also require an increase in employment once equipment is brought on line. An interesting ongoing project to mention is the use of biodegradable plastic film on the island of Losinj in collaboration with EcoCortec. As tourism is one of the most important sectors of our economy, and concern for the environment and responsible management of resources are our duty, the island of Losinj has chosen EcoCortec's biodegradable bags for daily us in retail chains, souvenir shops and hotels. By developing their own proprietary biodegradable films under the trade names EcoFilm® and EcoWorks®, EcoWrap® (biodegradable stretch film), EcoCorr® (multi-metal protective) and EcoCorr® ESD (static protective) , EcoCortec covers consumer goods market as well as specialized industrial markets with high standards in environmental protection. In addition to biodegradable films, EcoCortec also produces special polyethylene films, under trade name VpCI® 126. VpCI®126 films combine the latest film technology with the most effective corrosion protection for all of your metal products. You get complete product protection during storage as well as during domestic and overseas shipments, virtually eliminating any rust claims. 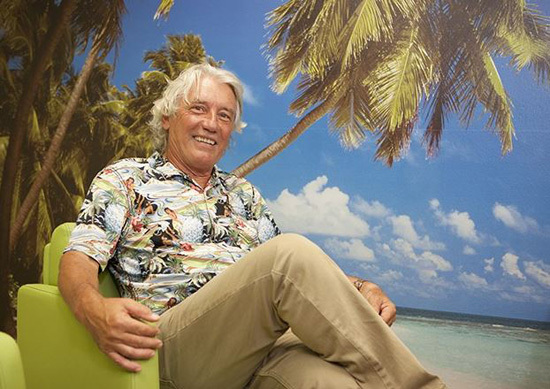 Boris Miksic, owner of EcoCortec, is a successful businessman on two continents, with over 40 years of experience. He is a person with vision and constant desire for the creation and improvement of existing achievements. Confirmation of his personal aspirations for continuous improvement is preparation of doctoral dissertation on the Faculty of Mechanical Engineering and Naval Construction at University of Zagreb. Even with the successful career, this dissertation represents a completion of a longtime scientific work with a number of his own patents on the corrosion protection and development of biodegradable films. 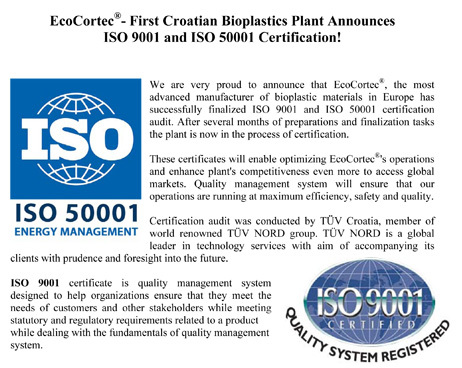 EcoCortec is the first Croatian bioplastics plant to produce ASTM D 6400 certified compostable films and bags approved internationally by the Biodegradable Products Institute (BPI). As global demand surged in recent years, EcoCortec gained the stringent third party certification to allow customers clarity and confidence when using Eco Film® and Eco Works® product ranges internationally. The ASTM D6400 standard specification confirms EcoCortec’s certified products will breakdown naturally, harmlessly and quickly in commercial composting conditions. EcoCortec’s certified products become a food source for the microorganisms and does not negatively affect plant growth or leave behind any residue or fragments. The daily consumption of biodegradable films and bags in everyday life is constantly growing as communities seek better methods of diverting valuable organic nutrients from incinerators and landfills to commercial composting facilities. Australia is developing legislation regarding the mandatory use of biodegradable plastics. European countries have started with the same initiative that will ultimately result in replacement of conventional films and bags with biodegradable materials suitable for composting. The United States is preparing regulations regarding the use of biodegradable and compostable labels on packaging and several states have already implemented programs where bioplastics are used as part of waste diversion initiatives. NEWS ALERT: EcoCortec receives BPI Certification! Beli Manastir, July 19th 2010. EcoCortec d.o.o. proudly announces record sales for the first six months of 2010. Thanks to your hard work and the recognized quality of EcoCortec products, our sales have increased by 380% yearly, compared to the first six months of 2009. These good results are an indication of serious market growth and increased demand for our Eco® and VpCI® product lines. To meet growing market demands, we have initiated new investments in equipment and production machinery. We are setting up a second line which will double our capacity in production of heat sealable and zip-lock bags. In addition to this line we will install new gusset and slit and seal system for off-line production of bottom sealed bags. For 2011 we are planning the start-up of a new, specially designed extrusion line for the production of biodegradable films. Projects that are underway will increase the range of our products and the total capacity by 30%, which is a guarantee of faster and better service to our customers. Again, we want to express our sincere thanks to all our distributors for your continued support. We look forward to seeing you at our European Sales Meeting which will be held in Madrid on October 14-15, 2010. Beli Manastir, June 15th 2010. EcoCortec as the first Croatian bioplastic plant will provide 200,000 biodegradable bags for the needs of the Galapagos National Park and Charles Darwin Research Institute. That is EcoCortec’s gift for the preservation of the only ecosystem on the planet that is 86% intact, with flora and fauna as it was in 1859 when Darwin published his historic theory on evolution. Also participating in this project are the National Geographic Society and Lindblad Expeditions. With this gesture EcoCortec, the the first Croatian bioplastic plant, is showing that Croatian companies are actively participating in the preservation of nature on a global scale. Eco Works bags, produced in Beli Manastir Croatia, meet strict EU and USA requirements on biodegradability. Available in 454 kg (1000 lb) gaylords packaged in a barrier bag. We are happy to announce that CorrTainer™ is now available in Europe. It is being produced and distributed by Cortec’s partner in Slovenia, Grafem d.o.o. For information on pricing and delivery terms please contact Grafem d.o.o. CorrTainer is a brand of VpCI™ corrugated boxes. The inside of the box is coated with Cortec’s Vapor phase Corrosion Inhibitor and a barrier coating which integrates safe, effective, multi-metal corrosion protection. CorrTainer is fully recyclable and repulpable. Does not contain nitrites, phosphates, silicates, or banned or restricted substances per RoHS and similar regulations. In many cases, CorrTainer eliminates the need for secondary packaging, is user friendly, and cost effective. CorrTainer is most frequently used by customers that are shipping single-use packs of spare parts such as automotive brakes, clutches, or similar equipment. In this situation, CorrTainer eliminates the need for inserting internal packaging such as polyethylene bags or paper wraps. CorrTainer has proven highly effective at preserving multipacks of small items such as bearings, tools, bolts, and similar items. CorrTainer also works well in bulk or large dimension boxes when used with VpCI interleaver materials for export and storage of components ranging from rough castings to high-end multi-metal telecommunications equipment. In this type of situation, customers often use VpCI interleaver materials in combination with a box/crate liner from VpCI impregnated plastic. Using CorrTainer eliminates the need for the box/crate liner. Products should be packaged clean and dry—free from contaminants such as fingerprints, oils, machining fluids, and corrosion. Simply place the item or items inside the box as you would any corrugated box. To achieve as long of protection as possible, ensure void space inside the package is minimized (use appropriately sized box for the application) and that airflow is not excessive. Close the box by sealing with tape or staples. Works® and Eco-Corr Film® that are certified commercially compostable per ASTM D 6400 and EN 13432 by BPI and Din Certco. All films that Cortec® manufactures as ‘biodegradable’ meets these international specifications and go through rigorous 3rd party reviews prior to launching. These Cortec® films are viable solutions for waste diversion goals of communities that want to remove as much material from landfills and incinerators as possible. The latest generations from Cortec® also include renewable content that further improves the sustainability of Cortec’s bioplastic options. Older technology, marketed as “oxo-degradable”, where chemicals are added to traditional plastics in an attempt to break them into smaller pieces, has been around since the mid 1980s. The following article from ICIS Chemical Business attests, there are several concerns with these oxo-degradable technologies. EcoCortec team is proud to announce that new Eco Works® T-shirt bags are now available for distribution throughout the world at highly competitive pricing, making EcoCortec Croatia global supplier of this new product. Eco Works® Biodegradable & Compostable Films and Bags are specifically designed to replace LDPE, LLDPE and HDPE films used in a wide variety of applications ranging from protective industrial films, retail packaging and agricultural films to high performance organic collection bags with drawstring closures. Eco Works® T-shirt bags have properties superior to traditional non-biodegradable bags without sacrificing biodegradability or compostability. Eco Works® is internationally certified product with certification logos by ASTM and DIN CERTCO. As compostability and environmental image become more and more important, Eco Works® offers a very marketable and responsible alternative to most films used in retail storage, shipping, display and packaging. After the last month’s successful launch of EcoWorks EcoCortec d.o.o. Is proud to announce that new and improved EcoCorr® is now available for distribution throughout Europe. EcoCorr® is a 100% biodegradable and compostable film utilizing Cortec’s patented VpCI® technology. In addition to offering 100% biodegradability, 100% compostability and VpCI® technology, EcoCorr® provides better tensile strength, tear strength and ultimate elongation than low density polyethylene films. EcoCorr® is also heat and water stable and does not disintegrate or break apart while in use. EcoCorr® provides contact, barrier, Vapor phase Corrosion Inhibitor (VpCI®) for up to two years depending on storage conditions. Once exposed to soil or compost conditions, EcoCorr® will disintegrate rapidly (within weeks) and completely without contaminating the soil. EcoCorr is internationally certified product with certification logos by ASTM and DIN CERTCO. Metal parts packaged in EcoCorr® receive continuous protection against salt, excessive humidity, condensation, moisture, aggressive industrial atmosphere and dissimilar metal corrosion. The Vapor phase Corrosion Inhibitors vaporize and then condense on all metal surfaces in the enclosed package. VpCI® reaches every area of your part, protecting its exterior as well as hard to reach interior surfaces. You get complete product protection during storage as well as during domestic and overseas shipments, virtually eliminating any rust claims. Once the film is no longer needed, EcoCorr® can be composted and will degrade into carbon dioxide and water within weeks. For shipping and storage applications, EcoCorr® is a great alternative to conventional polyethylene films. EcoCorr® has a shelf life of up to two years, when sealed in original packaging. Once removed and put to use, EcoCorr® will remain effective with regard to mechanical strength until film is placed in contact with material containing microorganisms, such as certain types of waste, soil, and compost. Under these conditions, 100% disintegration will occur within a few weeks with no residual contamination of the soil. NEWS ALERT: Eco Works® made in Europe! EcoCortec d.o.o. is proud to announce that new and improved Eco Works® is now available for distribution throughout Europe at highly competitive pricing. Eco Works® Biodegradable & Compostable Films and Bags are specifically designed to replace LDPE, LLDPE and HDPE films used in a wide variety of applications ranging from protective industrial films, retail packaging and agricultural films to high performance organic collection bags with drawstring closures. Eco Works has properties superior to traditional non-biodegradable plastics without sacrificing biodegradability or compostability. Eco Works® is international certified product with certification logos by ASTM and DIN CERTCO. This latest advancement in biodegradable plastic technologies offers composters a lower cost, more effective means of organic waste collection. As compostability and environmental image become more and more important, Eco Works offers a very marketable and responsible alternative to most films used in retail storage, shipping, display and packaging. EcoCortec d.o.o. is pleased to announce that we have surpassed our planned production output for our inaugural year and has already ramped up production by purchasing and installing new equipment. Triple-digit growth is expected throughout 2009 and 2010 and the company is investing heavily to prepare for the rapid growth. Production of biodegradable and VpCI films in the state-of-the-art Beli Manastir facility far exceeded initial projections largely based on the surge in demand from European customers for EcoWorks® renewable bioplastics and innovative, just-in-time availability of VpCI 126 Blue® corrosion inhibiting films, bags and shrouds. During the October 2008 European Sales Strategy Meeting in Beli Manastir, the company addressed the strategic importance of bioplastics for its customer base, especially during difficult economic times. Cortec’s patented EcoWorks® is largely made from carbon-neutral, annually-renewable plant-based resources which offer direct and indirect cost savings to endusers during production, use and disposal. Since EcoWorks® is largely based on renewable corn, there is a reduction of net carbon dioxide emissions of up to 70% - the equivalent of the energy used to light a family house for the month for every 100 kilos of EcoWorks® used. Having diverse raw material selection from traditional and renewable sources such as corn, beets and sugars gives producers and those relying on packaging more sustainable growth potential even during economic downturns. Additionally, by adhering to ASTM D 6400 and EN 13432 specifications for compostability, end-users of Eco Works® have a wider range of natural disposal methods than with traditional plastics. NEW PRESS RELEASE: EcoCortec d.o.o. expanding business! Cortec® EcoWorks® 45 biodegradable film for pet waste bags. Part of being a responsible pet owner is picking up after your pet. In many cities and communities, it’s also the law. For years pet owners have placed biodegradable dog waste into plastic bags that can take over 100 years to decompose. Cortec® offers a planet friendly solution: Doggy Poos™ bags. Doggy Poos™ bags are EcoWorks® 45 bags specifically sized and packaged for convenient and easy pet waste pick up and disposal. Proud pet owners that are concerned for the environment are now able to be responsible in their community by cleaning up after their pets while not damaging the environment. These bags meet the most stringent biodegradability standards worldwide, including EN 13432, ASTM D 6400, and are listed with Din Certo and BPI. Simply purchase Doggy Poos™ bags for your pet, then dispose of the waste in an environment rich with microorganism activity, and the bags will completely biodegrade into carbon dioxide and water within weeks. They are especially suitable for easy pickup and disposal in a garden or municipal collection bin. Doggy Poos™ bags are based on annually renewable content (45%), reducing the use of petrochemical plastics. They are completely shelf stable and waterproof – preventing messy leaks or tears. EcoCortec--a pioneer in sustainable packaging technology and manufacturing--is pleased to announce the availability of Eco Film bags specifically sized and packaged for convenient and easy pet waste pick up and disposal. Proud pet owners that are concerned for the environment are now able to be responsible in their community by cleaning up after their pets, while not damaging the environment. Eco Film bags are produced locally in Croatia and are available throughout Europe. Eco Film bags meet the most stringent biodegradability standards worldwide including EN 13432 and ASTM D 6400 and are listed with Din Certco and BPI. EcoCortec EuroCovers Ready for Just-In-Time Deliveries! It's that time again! We are pleased to invite you to the Cortec European Sales and Strategy Meeting. This year our meeting will be held in the beautiful region of Croatia – Baranja, in the city of Beli Manastir. This will be a great opportunity for those of you who didn’t have a chance to visit Cortec’s newest manufacturing facility, EcoCortec, to come and witness this state of the art production. The dates are Friday and Saturday, October 10th and 11th. We have arranged to have rooms available at the Patria Hotel in Beli Manastir and Aristos Hotel in Zagreb for Sunday evening. A tentative agenda is attached for your review. As you can see, we will do our usual Sales & Product review and strategy discussion and seminars on the "hottest" Cortec topics. Please confirm your hotel reservation and seminars you will attend with Ivana Radic Borsic or Dijana Zrinski. You can contact Ivana at: ivana@cortecvci.com or 385-98-267-572 or Dijana Zrinski at dijana@ecocortec.hr or 385-31-705-011. Cortec Corporation is pleased to announce implementation of stock program for our European and Asian distributors. Our best selling standard sizes are now available in metric, stacked on EU pallets and will be shipped within 24 hours from receiving your order from EcoCortec, Beli Manastir. This is our commitment to you in order to help you increase your trading margins. We are using this opportunity to inform you that European Sales Meeting is scheduled for 10th and 11th of October 2008, in Beli Manastir, Croatia. Detailed program of exciting new sessions and fun events will be sent to you in the near future. Organized by Institute for Packaging and Graphic Arts Industry, "Packaging, Graphic Arts Industry" trade journal and Tectus d.o.o. company, CROPAK 2006 awards and diplomas for best packaging in Croatia were awarded in 5 categories on May 18th 2006 in "Plitvice Lakes" National Park. Purpose of this competition is to promote using the package as important factor in protection and in the marketing. Also like support innovation leading to lower environmental impact of durable plastic products, and the identification and evaluation of eco-efficient. Between 37 nominations, EcoCortec has conquered even two first prizes.